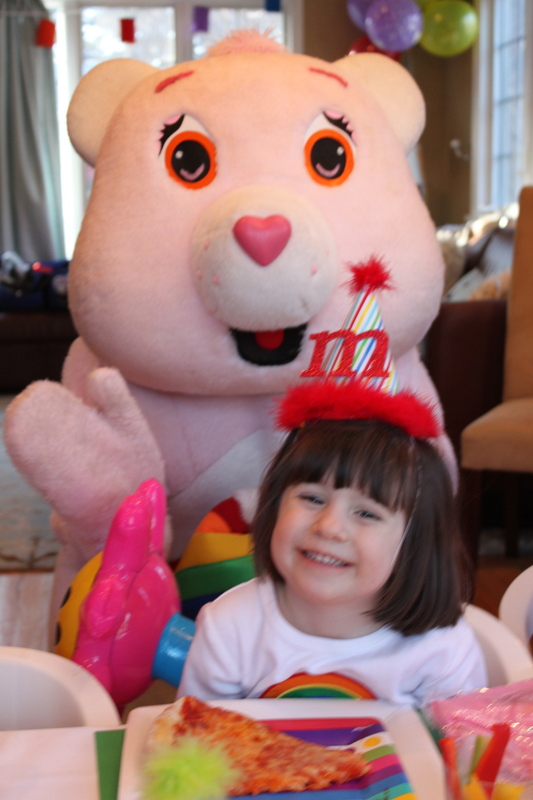 My little Morgan just turned 4 and she decided shortly after her 3rd birthday that she wanted a Care Bear party next. 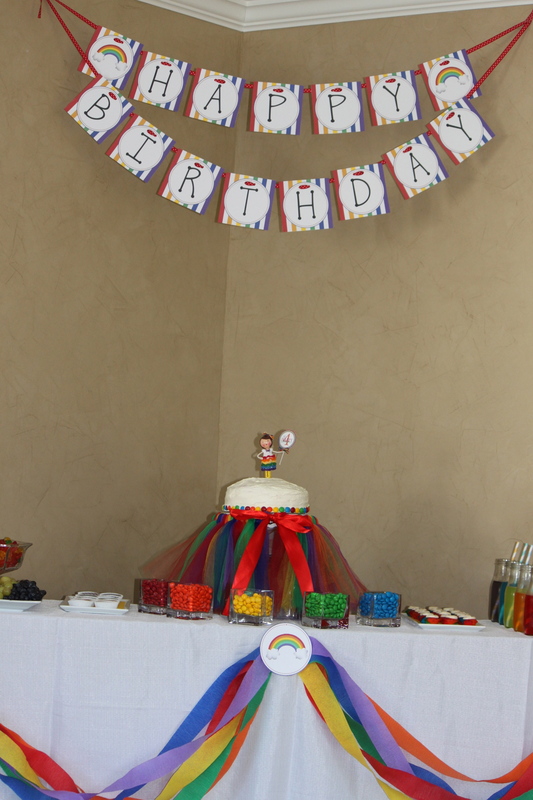 I’m not a huge fan of all out character parties but can’t deny my children their wishes so I usually choose a color or two that has to do with the character and most of the decor is designed around the colors rather than the character itself. 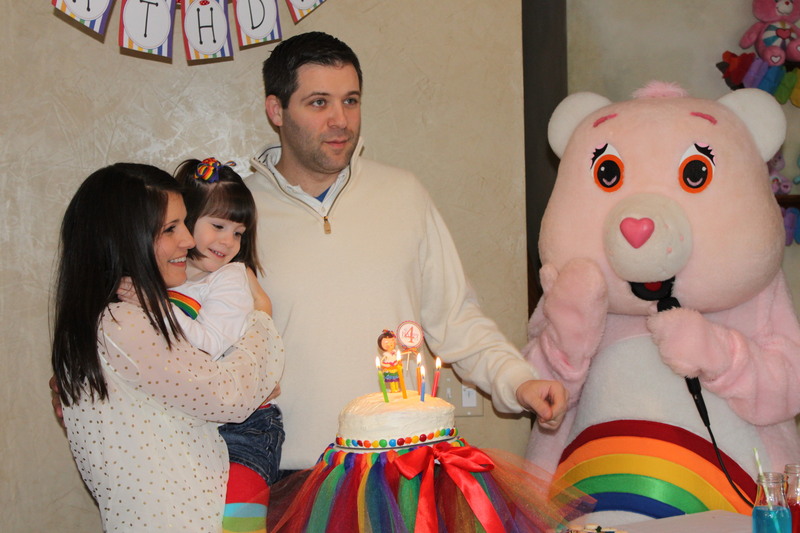 For this party, I chose rainbow colors since Care Bears live in the clouds and play on rainbows. 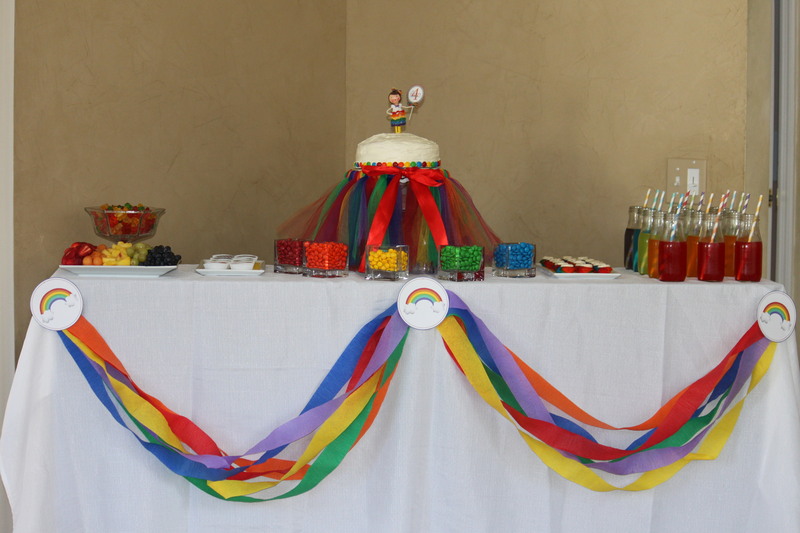 This is the dessert table I designed with lots of rainbow colors and desserts. 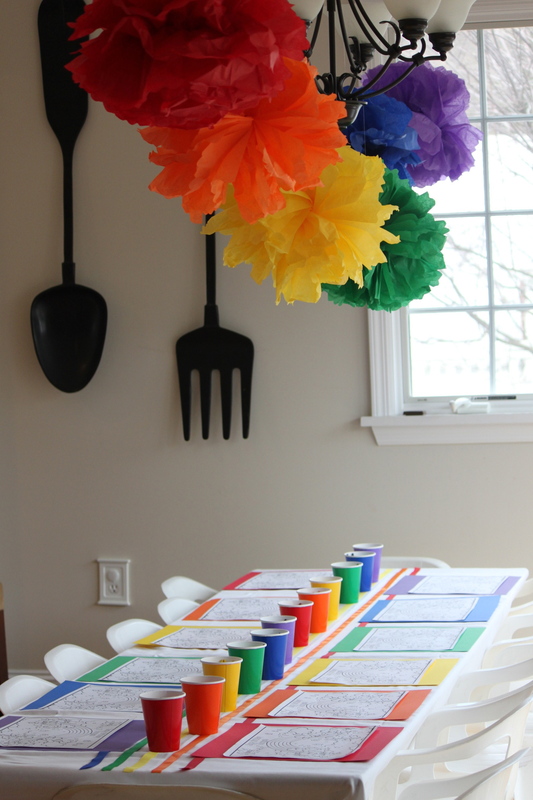 I created a rainbow banner to hang above the table. 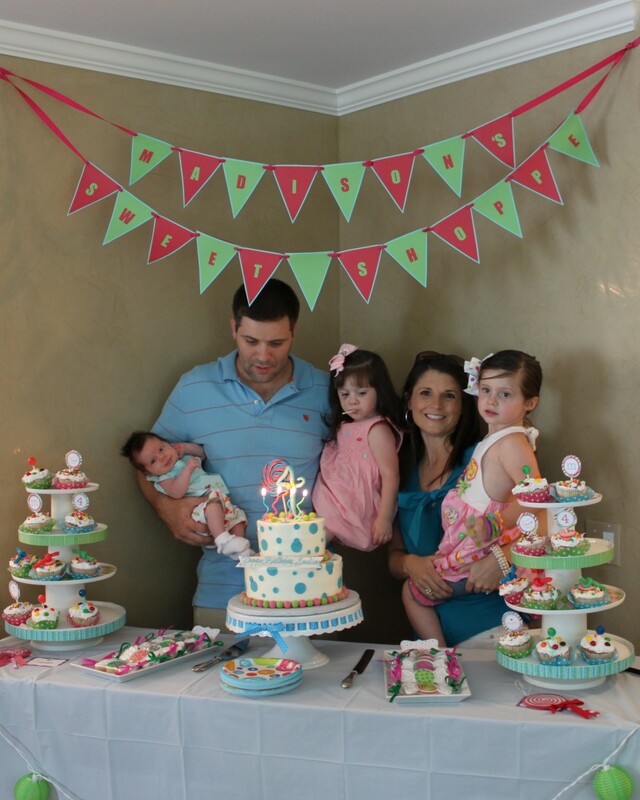 The cake was homemade this year…you’ll see why. 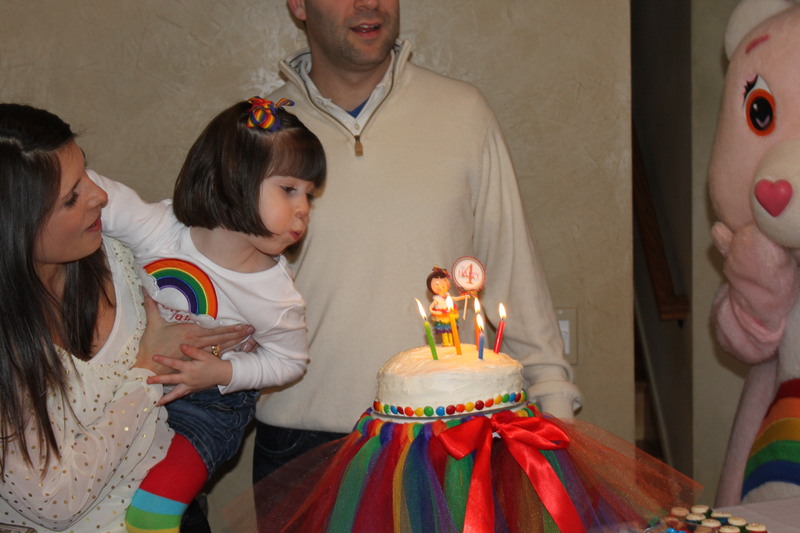 I had ordered Morgan a rainbow shirt and tutu on Etsy but the tutu didn’t fit her. It fit the cake stand perfectly and really made the table pop. 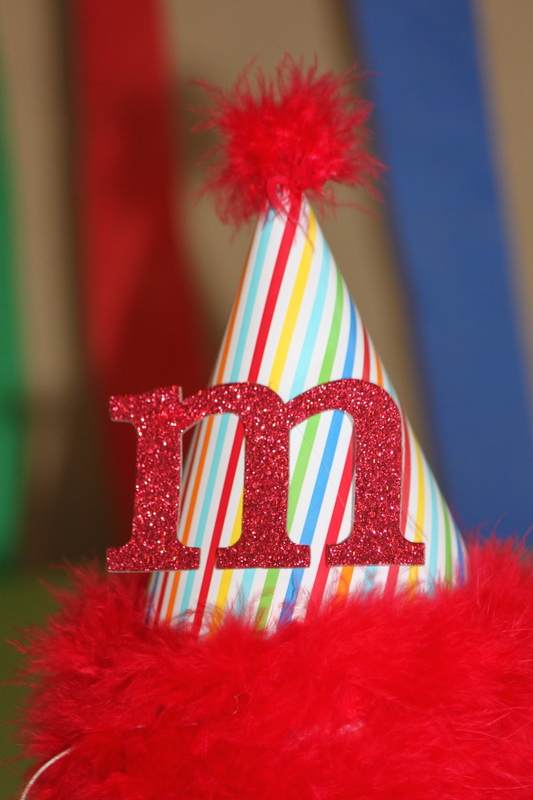 The colored M&M’s brought in a lot of color as well. 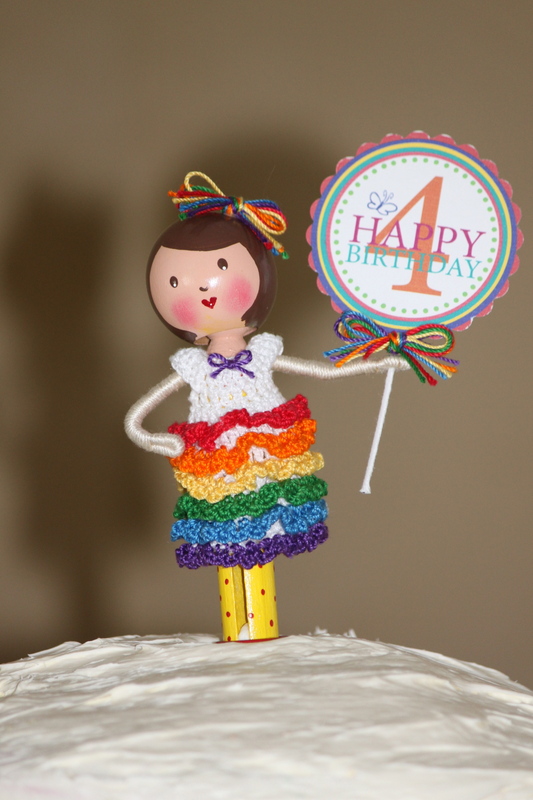 The adorable cake topper was from Creating from the Heart on Etsy. This little cake topper is so well made and the details are amazing. She even looks a little like Morgan. I used the same Starbucks Frap bottles from Madison’s Princess Tea Party to serve a rainbow of drinks. I used Gatorade since it comes in so many bright colors. 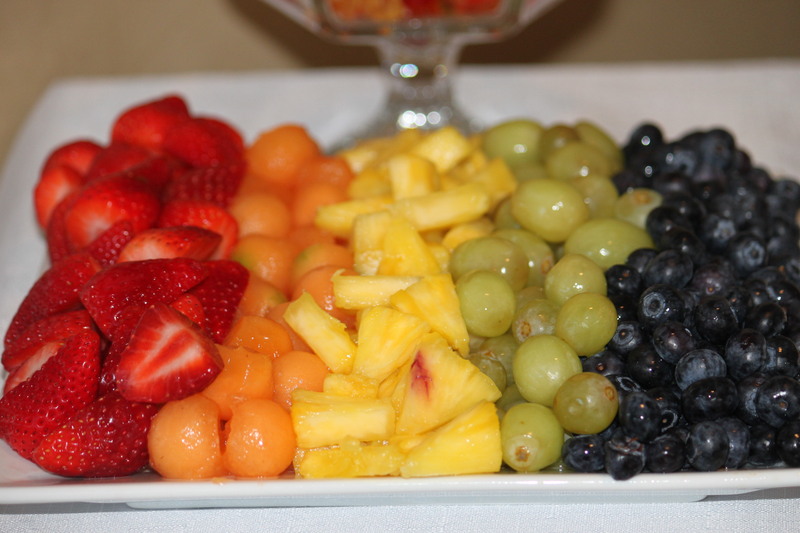 Along with the cake, I served a rainbow of fruit. 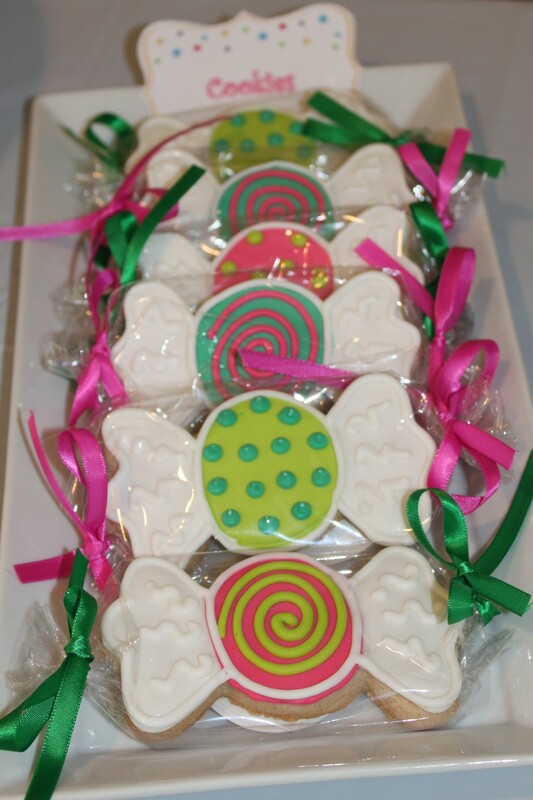 These Chocolate Covered Oreos from Sweeties by Kim were delicious and pretty! 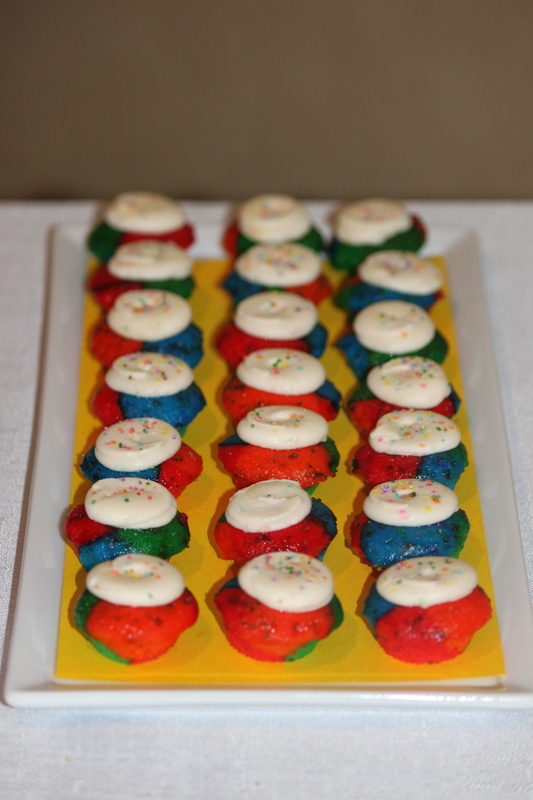 I got these yummy mini-cupcakes from Baked by Melissa in NYC! The rainbow party hats were found at Target. I added a little pizzazz to them by trimming them with feather boa. I put a sparkly “M” on Morgan’s hat to personalize it. 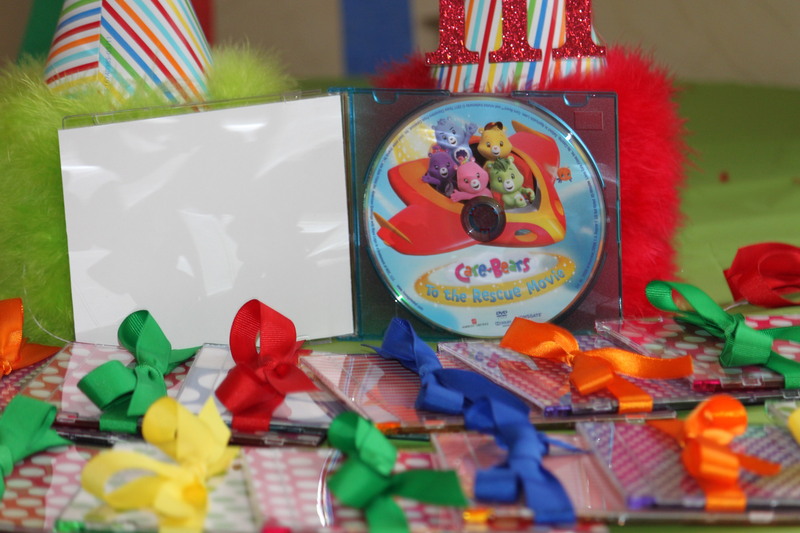 The party favors were Care Bear DVD’s. 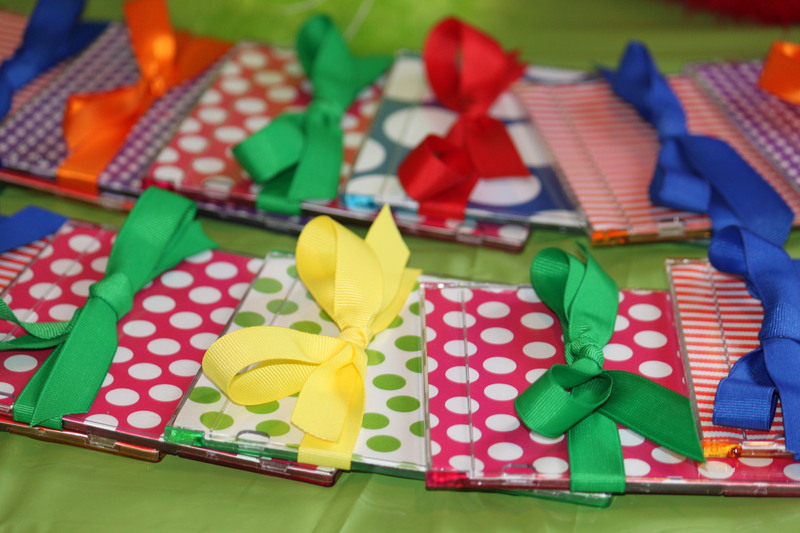 I put them in slim jewel case and lined them with colorful scrapbook paper and tied them with a matching ribbon. 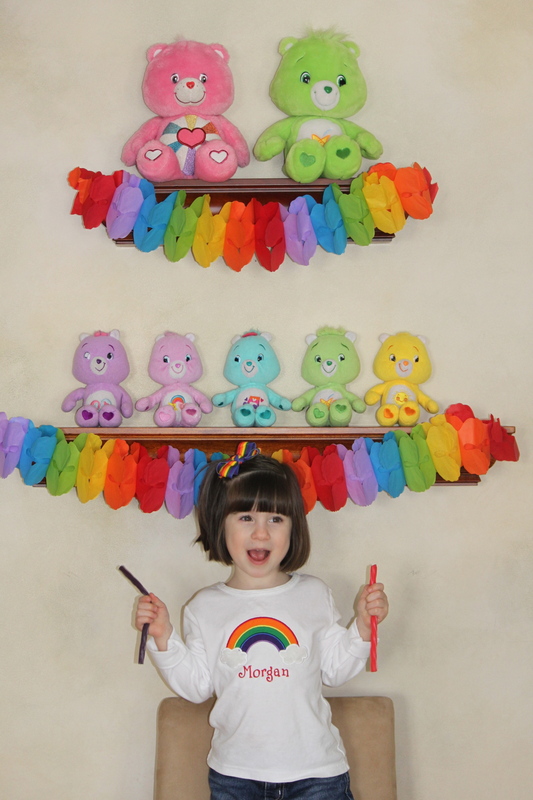 Morgan’s Care Bear collection made for a great display and photo opp spot. 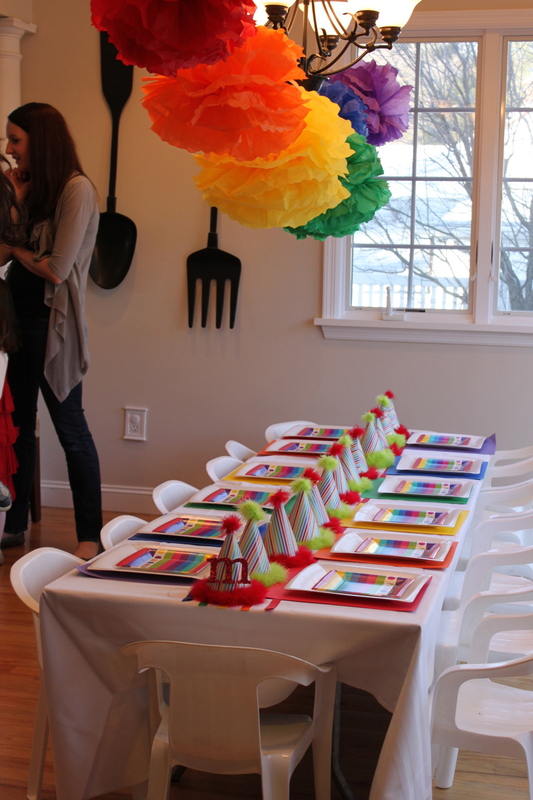 Care Bear coloring sheets and crayons sorted by color in matching cups awaited the party guests. 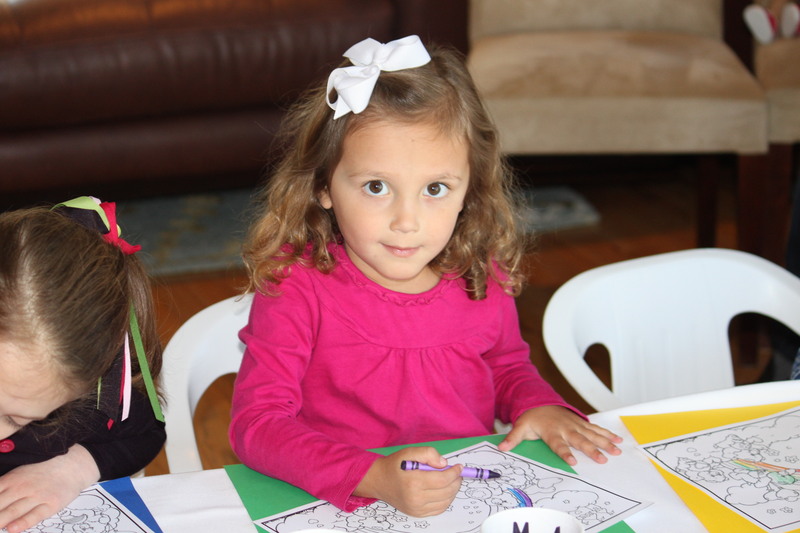 Everyone enjoyed coloring while waiting for the guests to arrive. 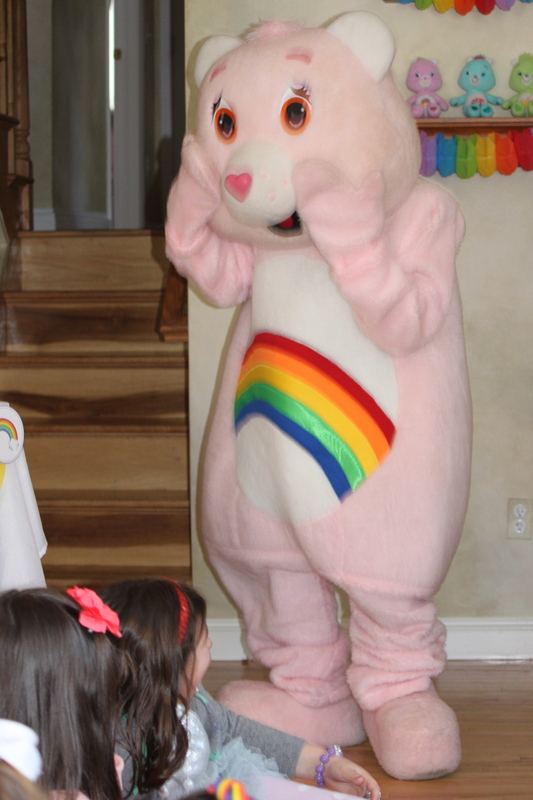 The girls were so surprised when a giant Care Bear joined us. 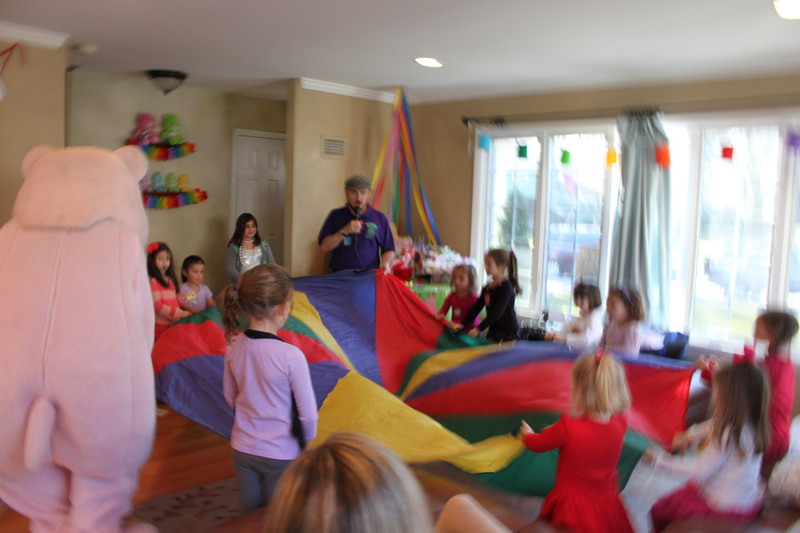 They played parachute, freeze dance, limbo, had a magic show and scavenger hunt with the Care Bear from Dave’s Cast of Characters. After an hour of fun and games, we sang happy birthday and enjoyed pizza and cake. 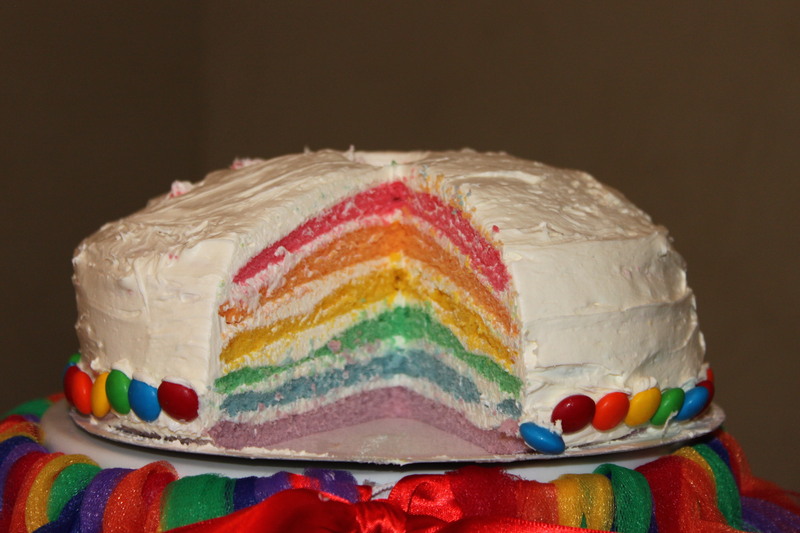 The kids were so surprised when I cut the cake and revealed this rainbow inside! 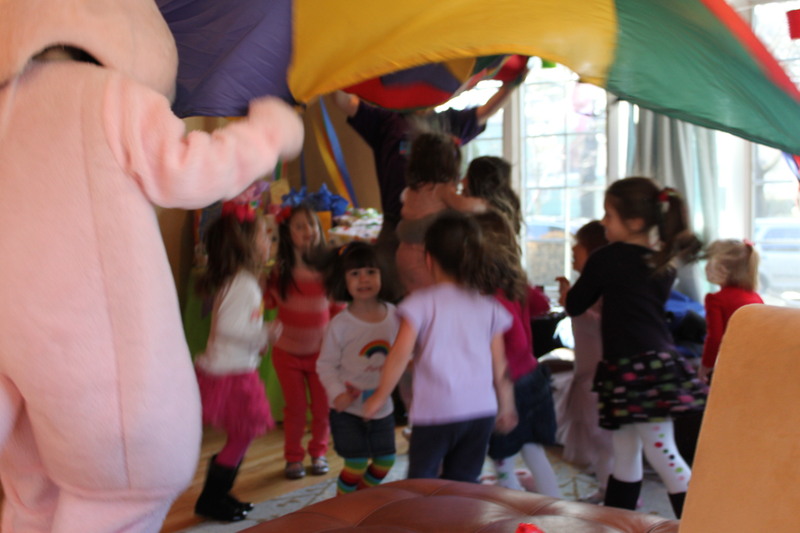 This was one of the most fun parties we’ve had. Morgan had a blast! 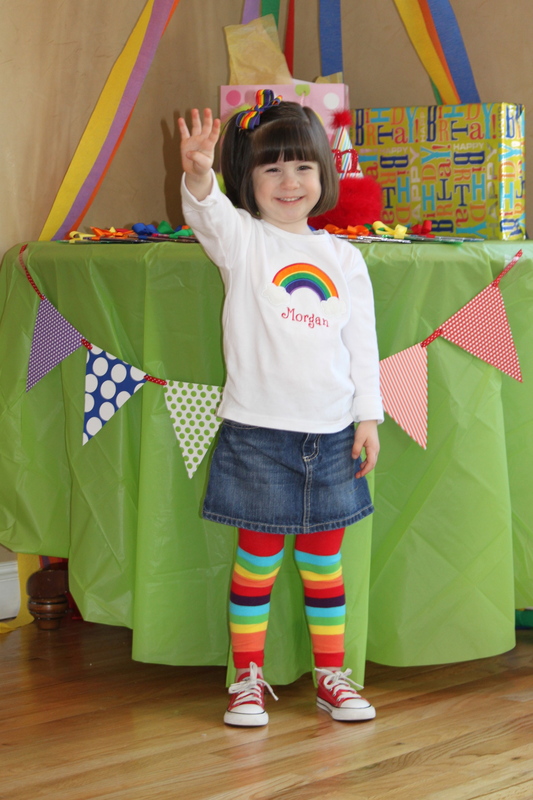 Happy 4th Birthday, Morgan Paige. 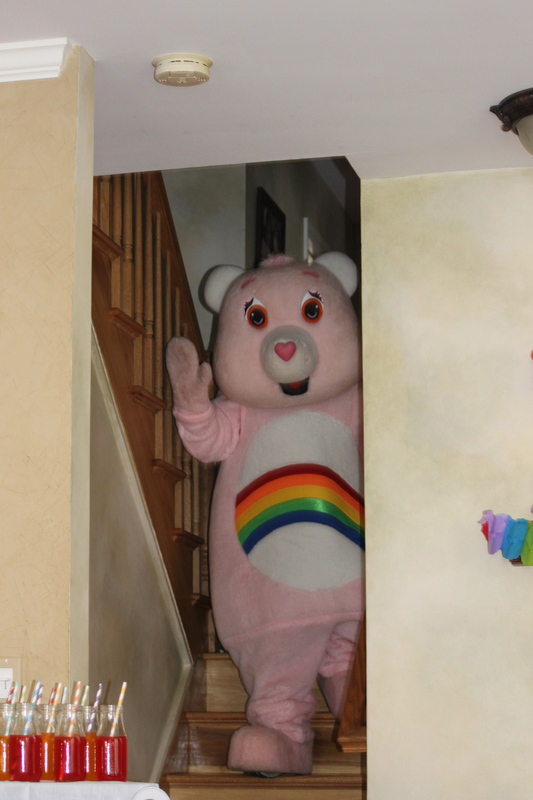 I hope your Care Bear cheer is always here. 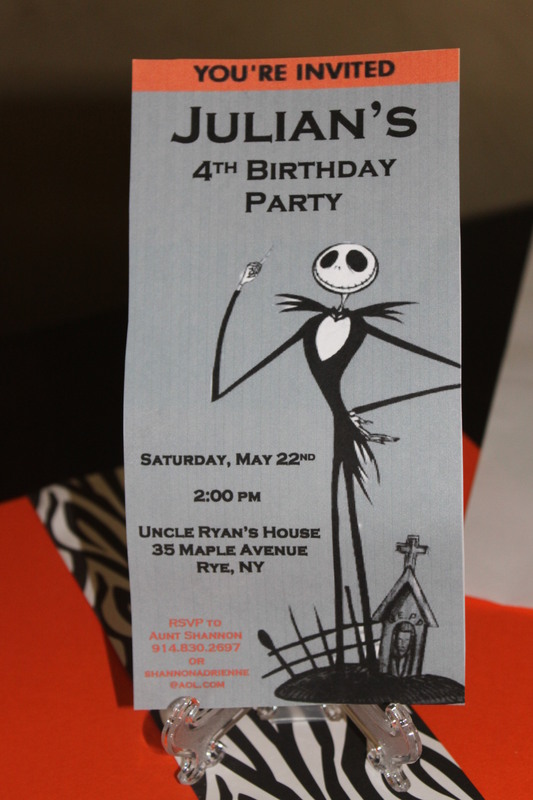 I threw this party for my nephew when he was turning 4. 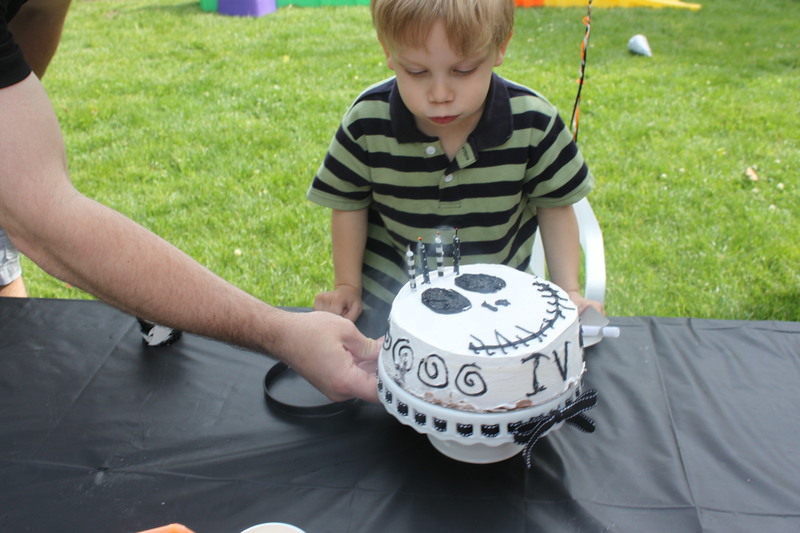 When he told me he wanted a Nightmare Before Christmas party, I was stumped. I had never seen a party with this theme on any of the blogs I read and I had never seen the movie, so I had no clue how I was going to pull it off. But I wanted to make him happy so I set off to research A Nightmare Before Christmas. 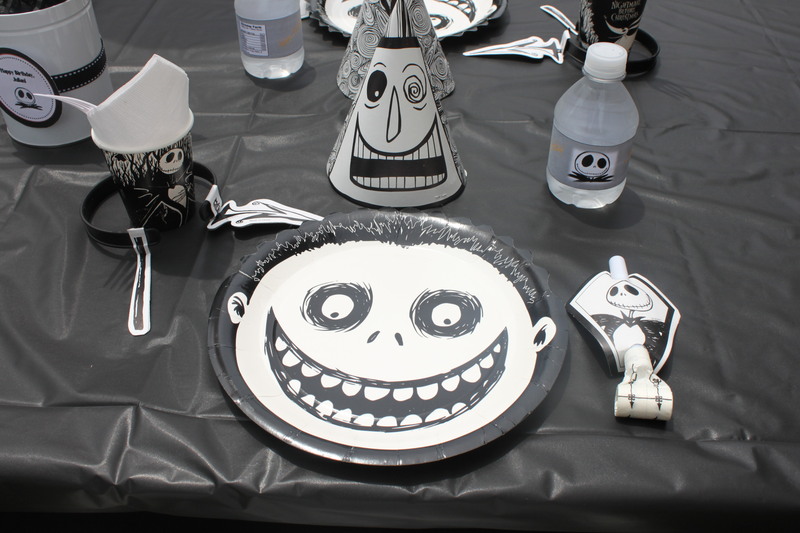 I chose the main character, Jack Skellington as the focal point and the colors black, white and orange. Now, this party was in May…springtime…so not much out there that time of year to do with skeltons and pumpkins. Come to think of it, this would make a great theme for a Halloween Party as well. I found a few things on ebay and created most of the party decorations myself. Here is how it all turned out. The sign welcoming guests to the party. I put some decorations in the plant next to the door. 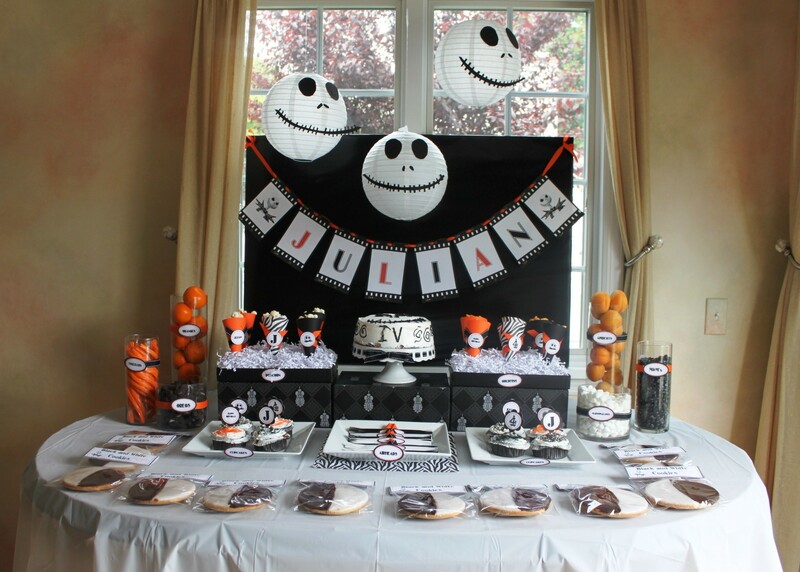 The main attraction…the dessert table. 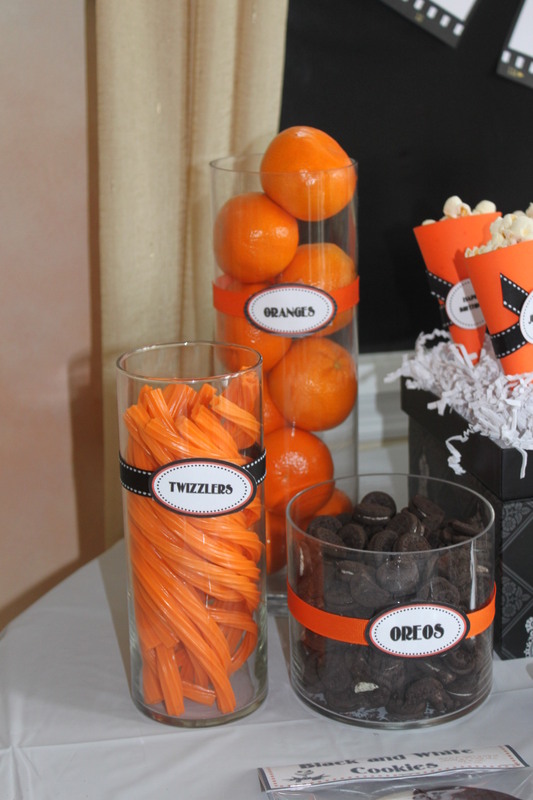 All of the treats were either black, white or orange to match the theme. 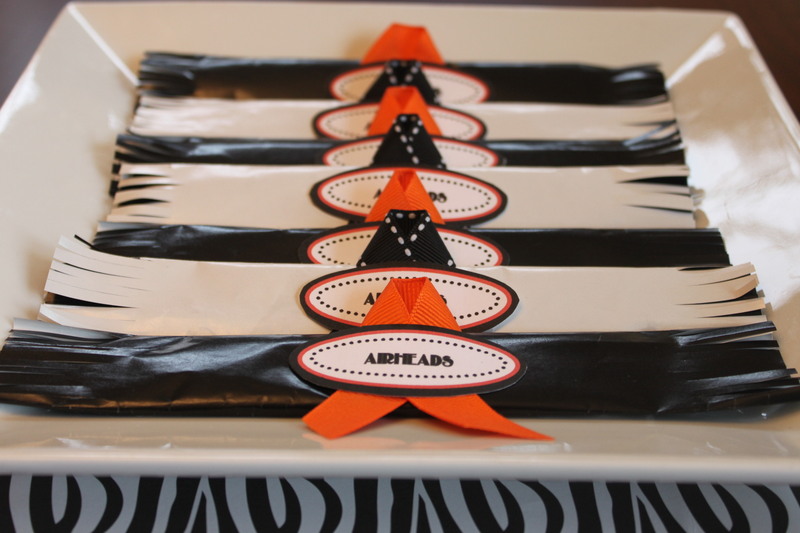 Airheads (because skeletons have nothing but air up there) wrapped to match the decor. 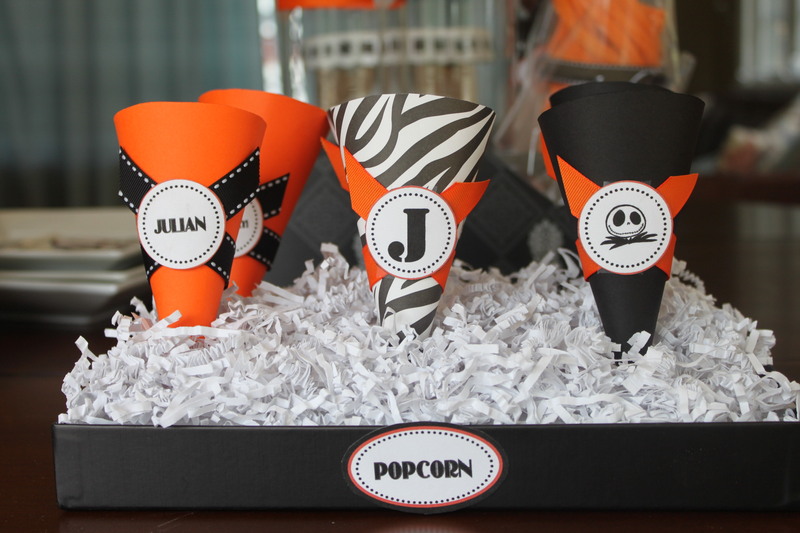 I made cones to hold popcorn. 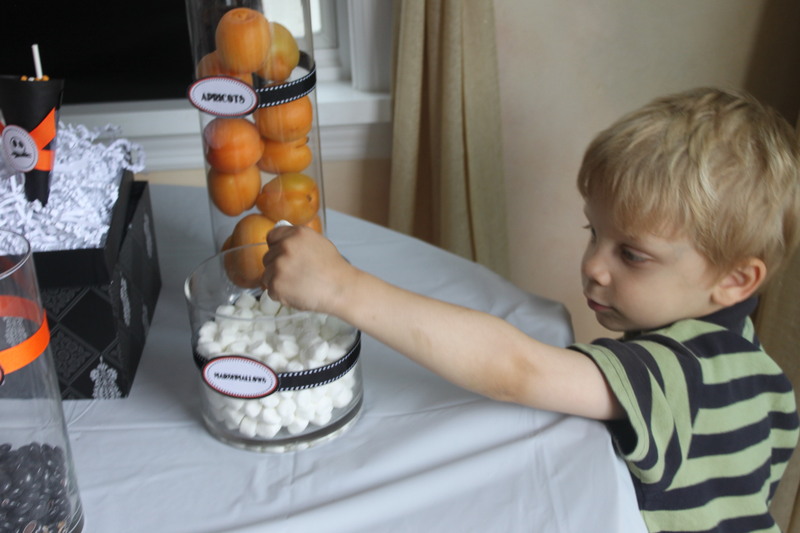 The kids loved these, when they were empty the would re-fill them with other treats from the table. 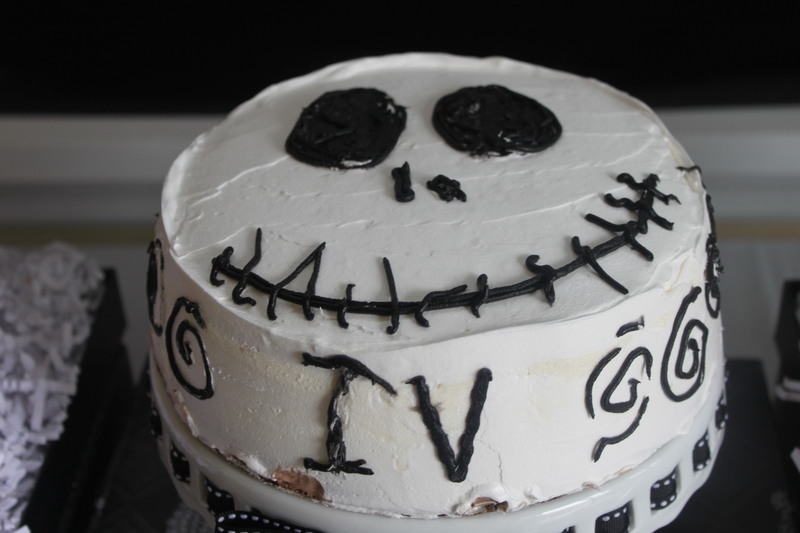 And last but not least an ice cream cake from Carvel (nephew’s request) that my husband decorated to look like Jack Skellington. I think he did a great job! Thanks babe! 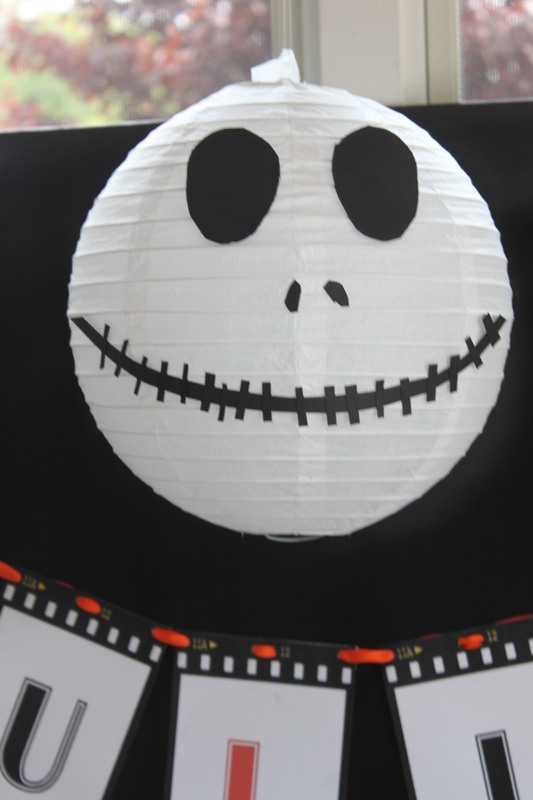 Hanging above the dessert table were three white paper party lanterns from Party City that I decorated with black scrapbook paper and double sided tape to look like Jack Skellington’s head. 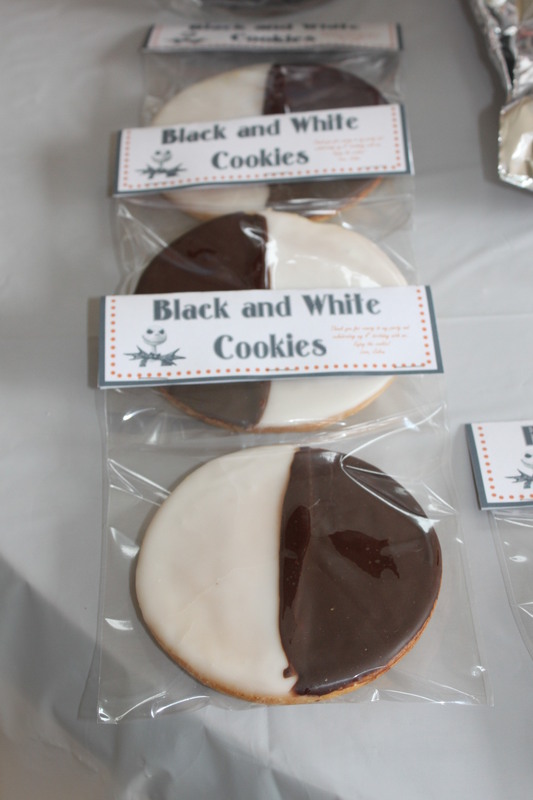 Favors for the guests were black and white cookies…from the Italian bakery in town. 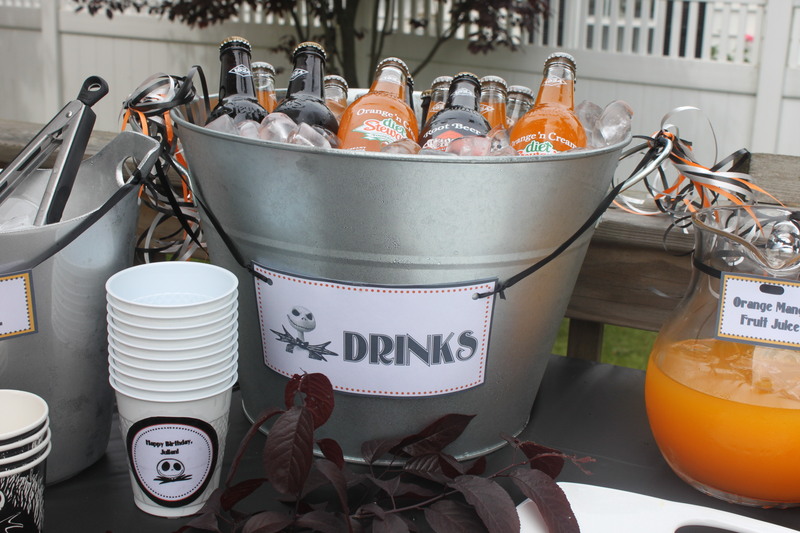 Drinks were black and orange too…rootbeer and orange cream soda. I also had orange mango fruit juice for the kids. I won an 8 pack Nightmare Before Christmas party set on Ebay. These were perfect for the kid’s table. 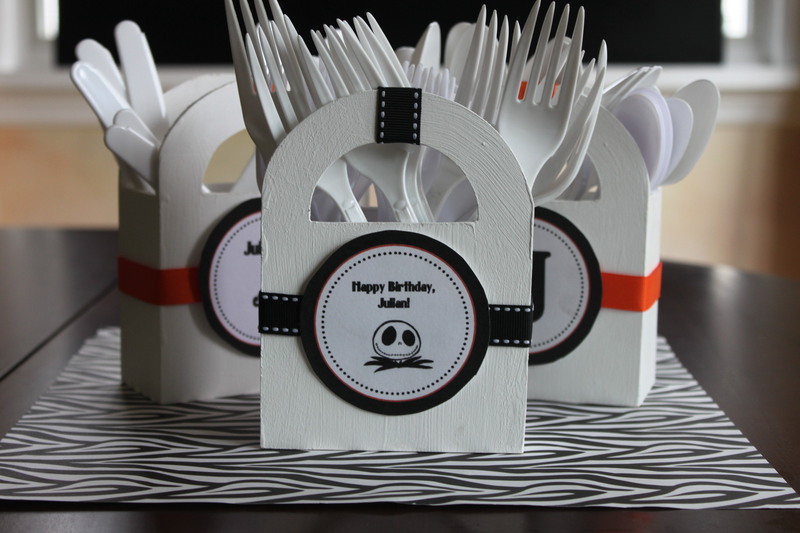 Everything gets decorated…even the utensils. The birthday boy on his special day. 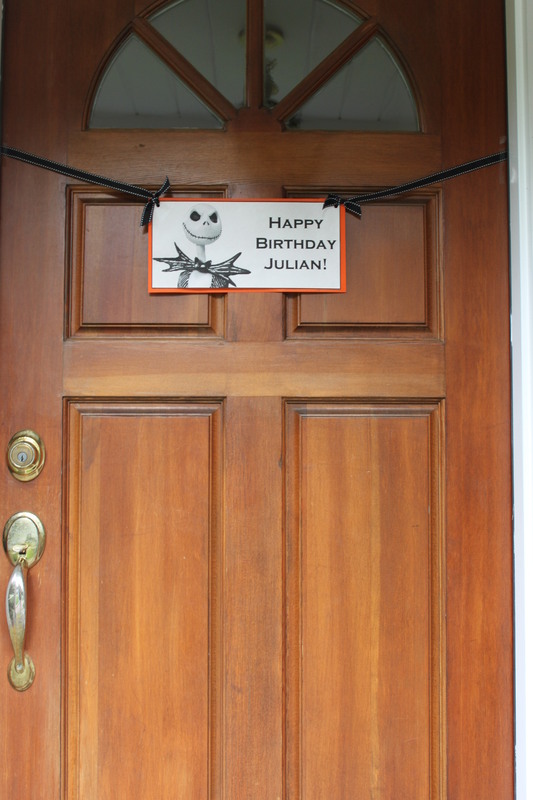 I hope you had a wonderful 4th birthday, Julian. 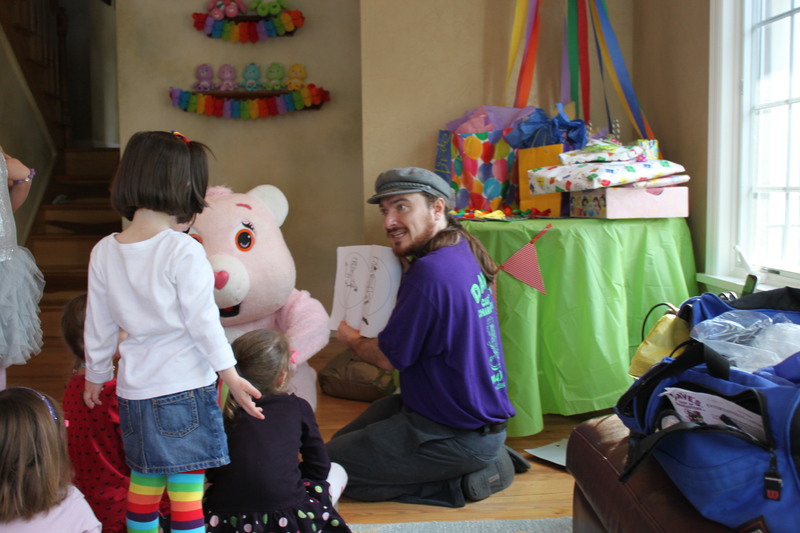 Today I’d like to share my daughter Madison’s 4th birthday party. 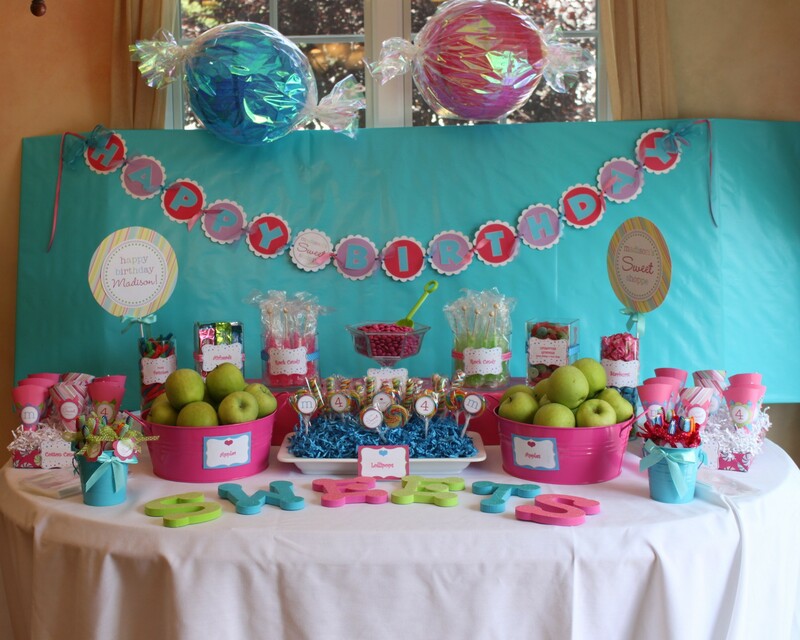 The theme we chose was a Sweet Shoppe theme. 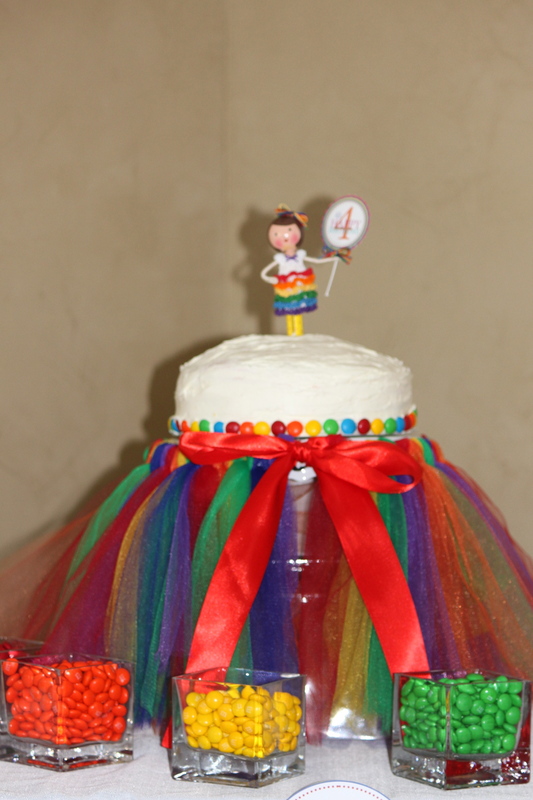 I decided on this theme shortly after her 3rd birthday Ice Cream Shoppe party. I had read an article in People Magazine that featured Trista Sutter’s (The Bachelorette) little boy Max’s 1st birthday party. 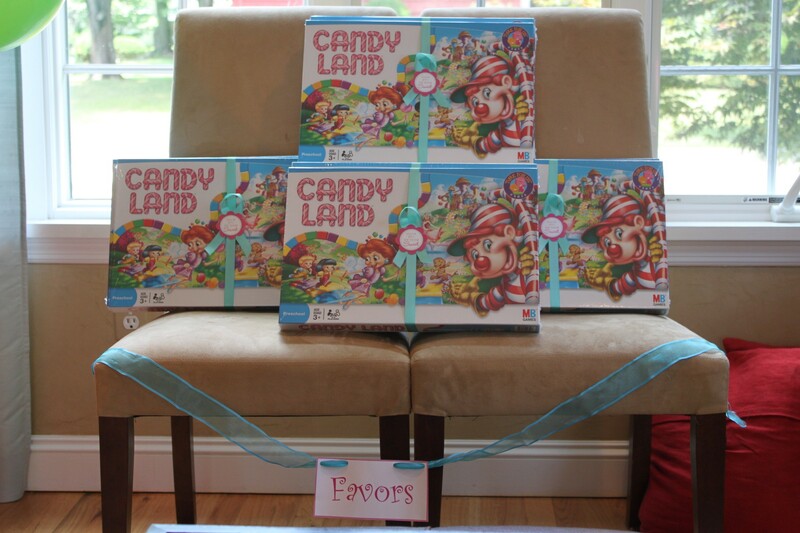 They did a CandyLand theme party and it was absolutely adorable. 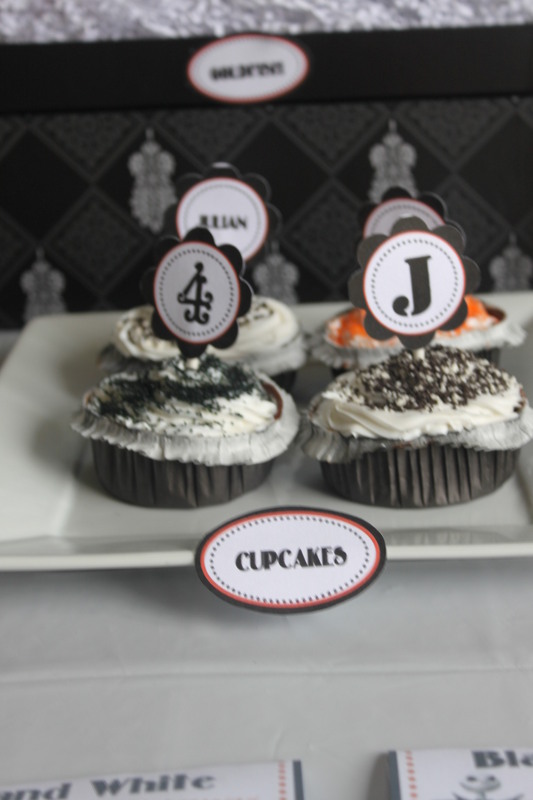 I loved all of the ideas and just knew I had to incorporate them into Madison’s next party. She loved candy so it didn’t take much convincing. I found the site Hostess with the Mostess who helped plan little Max’s CandyLand party. There was so much eye candy on there, I fell in love with the whole blog and was hooked. 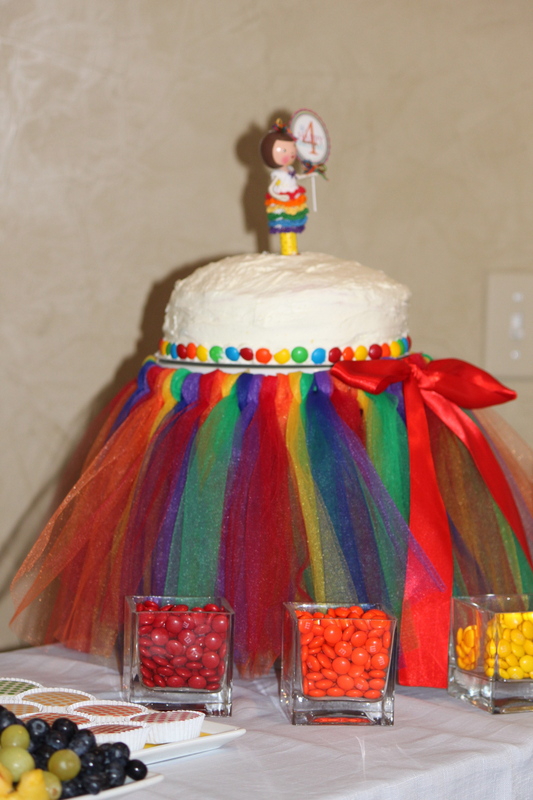 Hostess with the Mostess led me from one blog to another and I saw so many beautiful Candy themed parties. I didn’t realize it was such a popular theme! 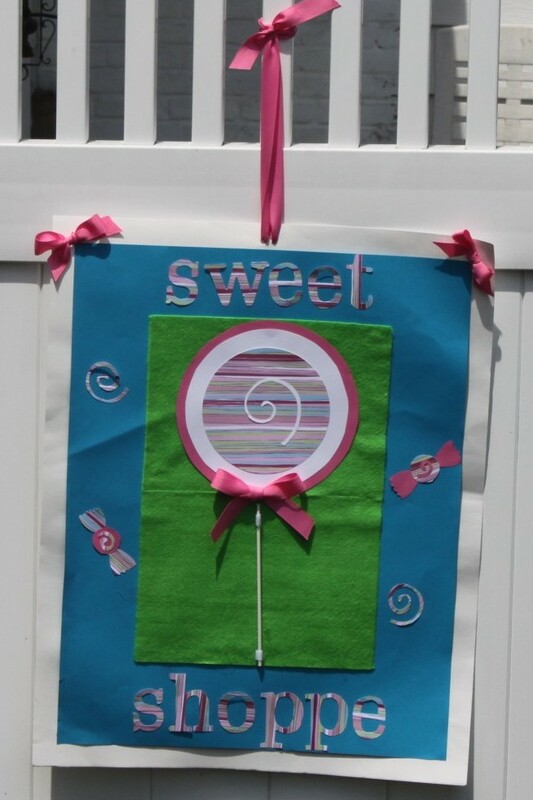 I ended up coming across a blog called The TomKat Studio whose owner Kim had featured a cute little Lollipop Party for her daughter and to top it off, she was selling the items she created for that party on Etsy. 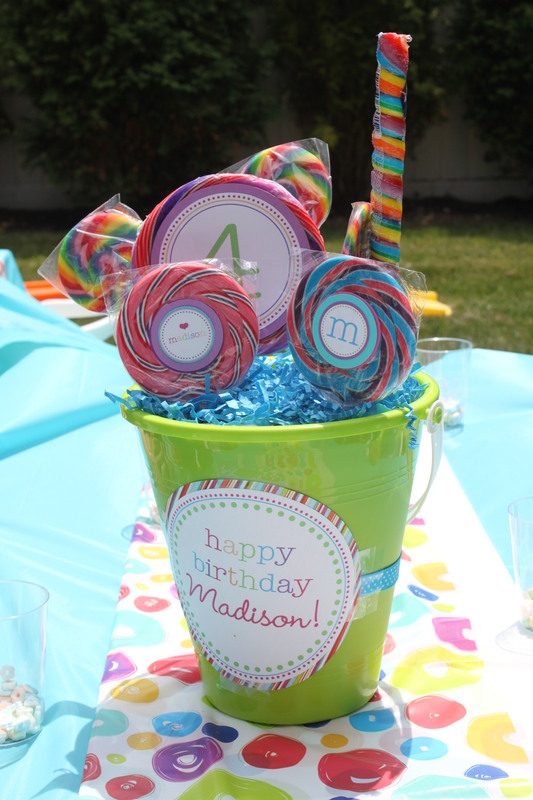 I am pretty handy on the computer but was running out of time so I ordered Kim’s Lollipop Party Package and it was so adorable. 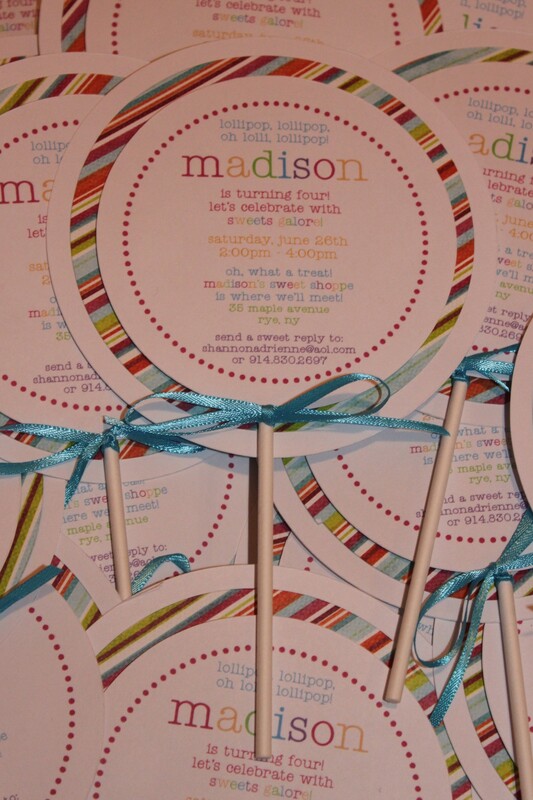 The package I bought was a printable PDF file that included a banner, cupcake toppers, party circles, signs and the oh so cute invitation. I was able to print everything at home and assemble it myself- the best part because I love crafty projects. 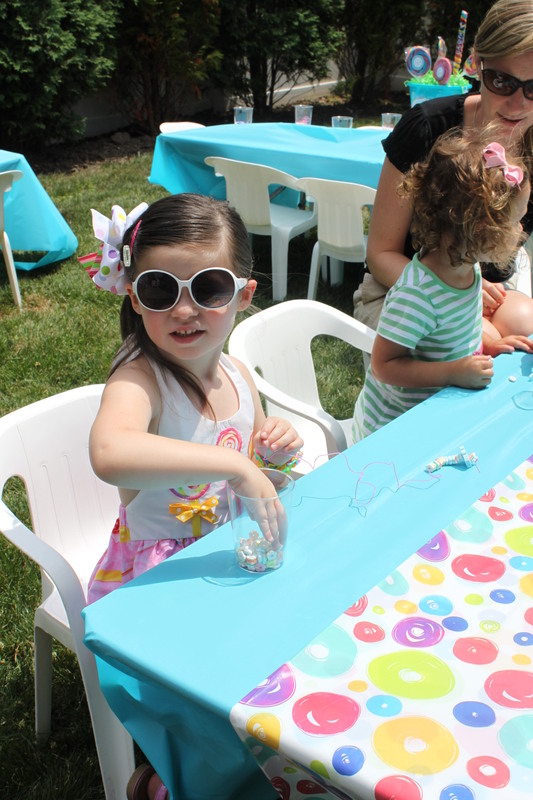 The party was a huge hit and the birthday girl had a fabulous time. I’m going to try to give as much detail and credit as I can remember for the ideas I used. 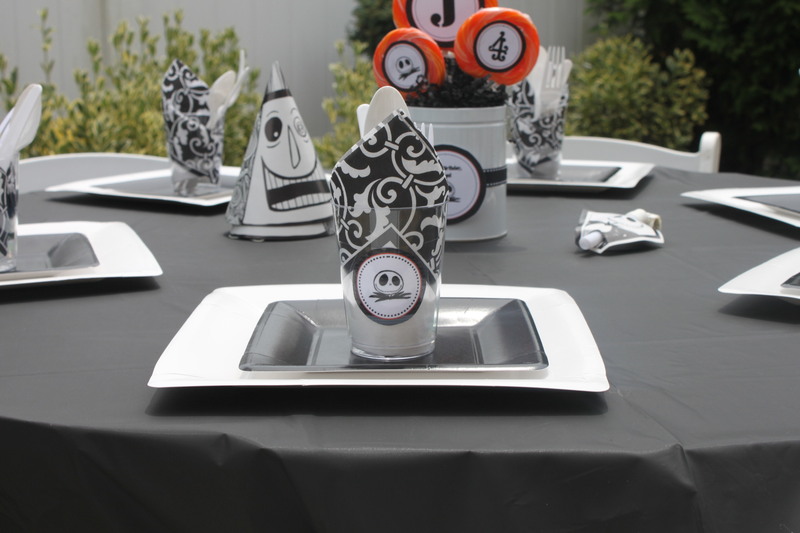 The party was last June and I looked at so many blogs by crafty mommy’s who also used this theme and I tried to incorporate lots of those ideas, as well as my own into this party. I had so much fun planning this one…. First up…the invitations. Thanks Kim! These were adorable. 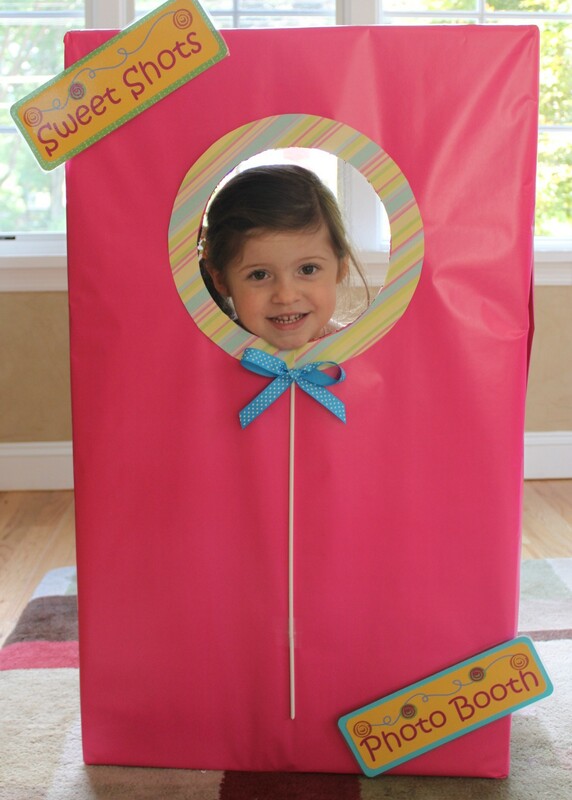 I made this photo booth using a large box that I wrapped in bright pink wrapping paper. I cut a circle for the kids to poke their face through, and made it look like a lollipop. The kids loved it! The back was open so the kids could go inside of it. Something fun and different. 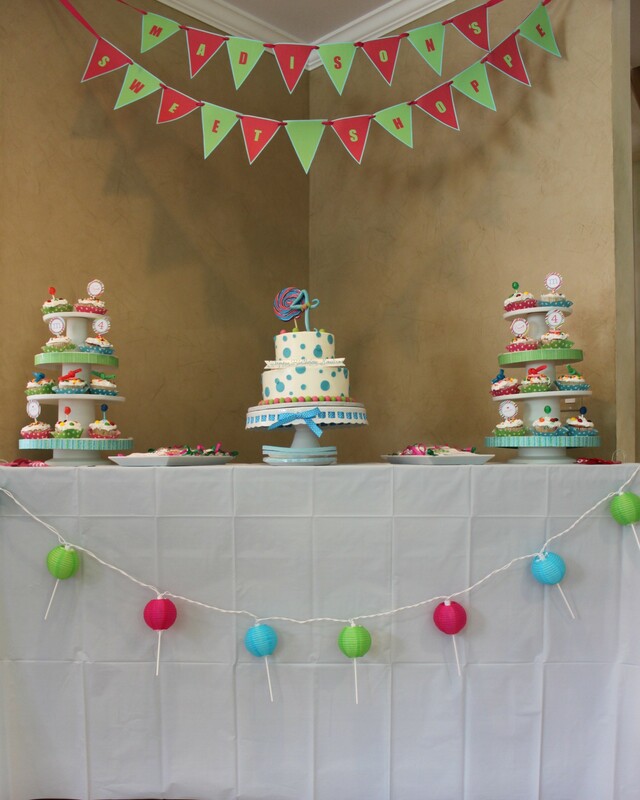 This is the cake table. I made the banner hanging above…my first one ever! I liked that the table was in the corner because we could stand behind it when blowing out the candles without it being in the way during the party. The cake was from a local bakery (Corner Stone Caterers). 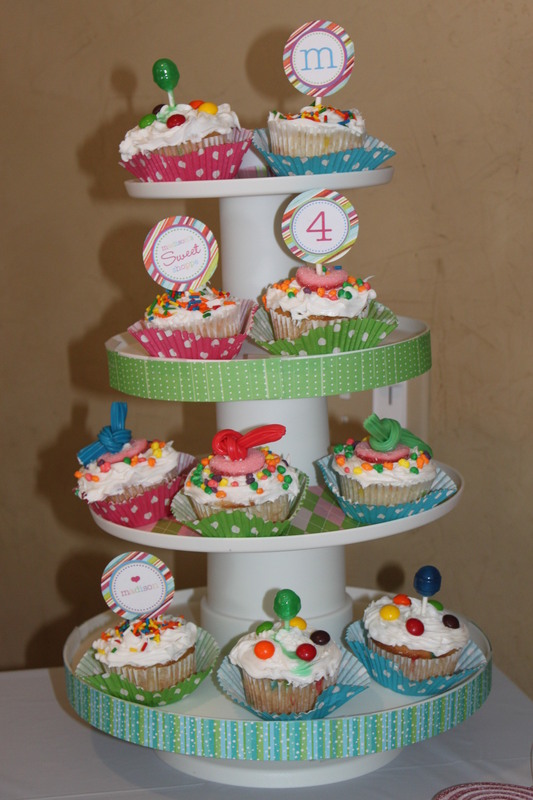 I made the cupcakes and used Kim’s party circles for toppers. Super cute! 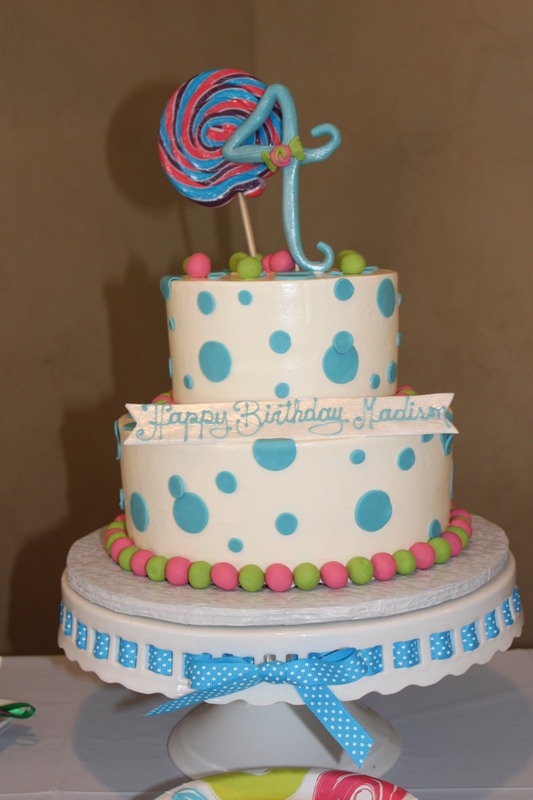 I also stuck a Dum Dum in some and used knotted twizzlers on a few. The plates held the yummy cookies from The Fancy Lady Gourmet on Etsy. Draping on the front of the table was colored lanterns that I found at CVS. You could plug them in and they light up, but I didn’t do that. I taped a lollipop stick to each of them to make them look like colorful lollipops. This was a last minute up to 2 AM the night before add- thanks to my cousin Tanya for the idea..turned out super cute! 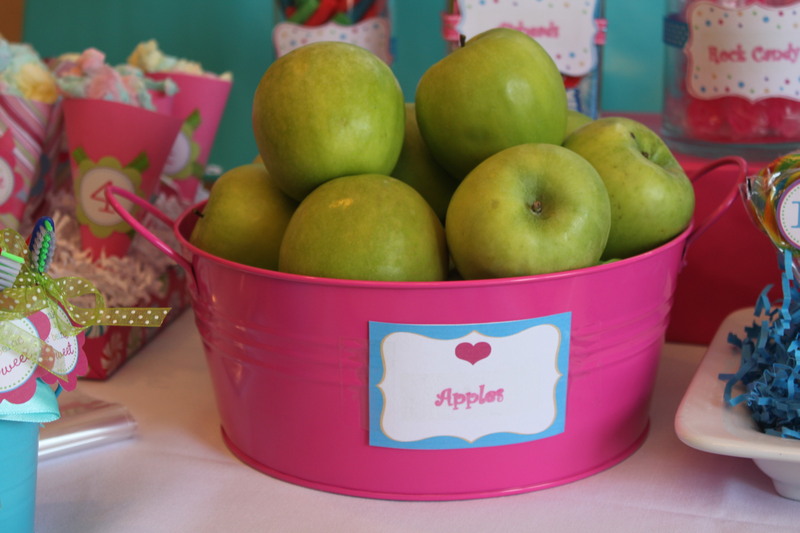 The table also included sweet Granny Smith apples which more than one child chose to put into their treat bag. The parents were thankful I included healthy options on the table. 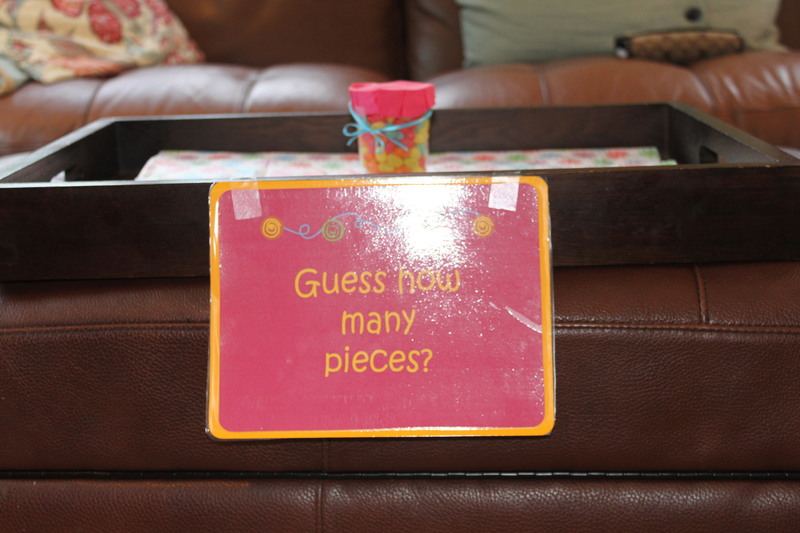 I made the cones from scrapbook paper and attached one of Kim’s party circles to the front. 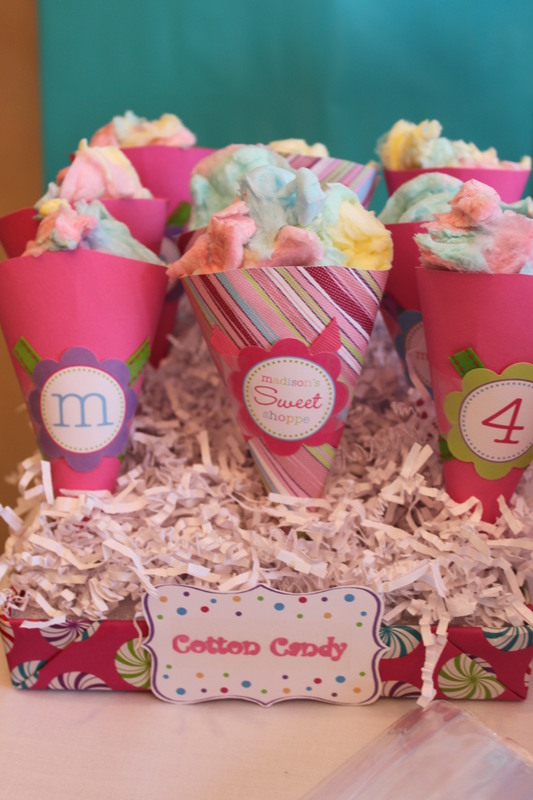 I filled the cones with cotton candy and caramel popcorn. 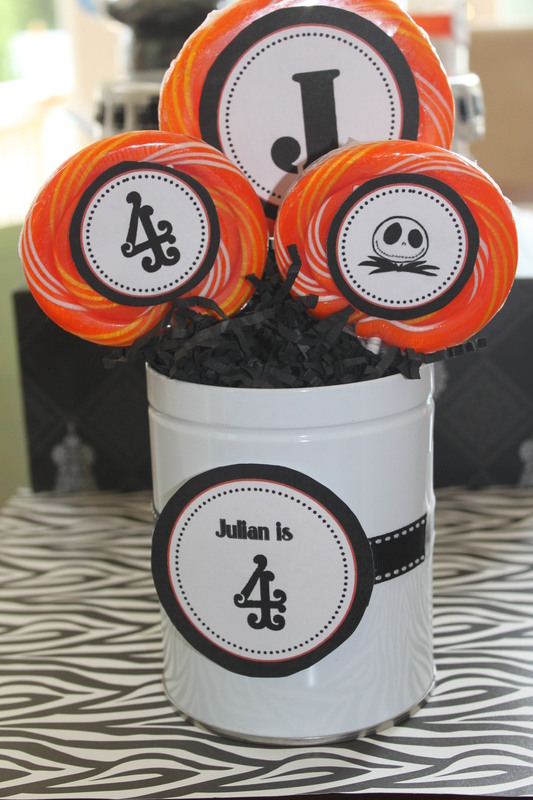 Other goodies on the table included lollipops, rock candy, m&ms, tropical twizzlers and gummy lifesavers. 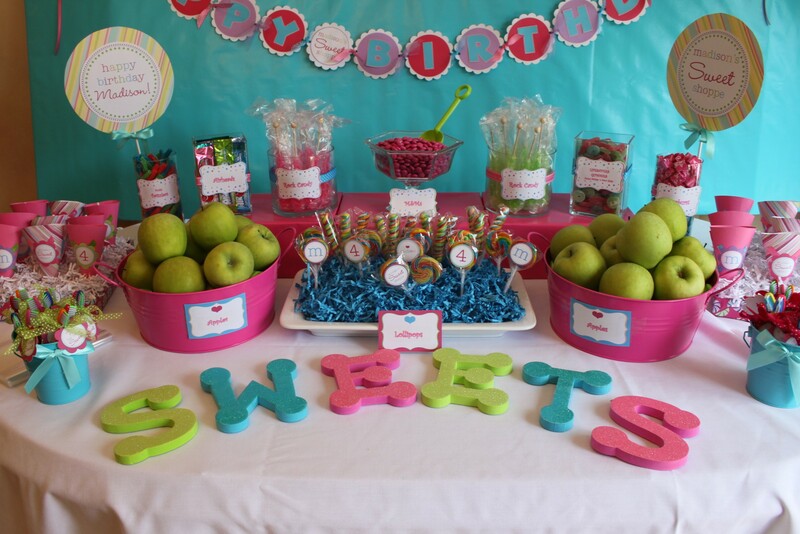 All of the candy were in colors that coordinated with the party colors- bright pink, bright green and turquoise. The letters on the table spelled out SWEETS. They are large foam glittery letters that I found at Michael’s. The candies hanging above the table are actually party lanterns that I covered in cellophane and tied the ends to look like wrapped candy. 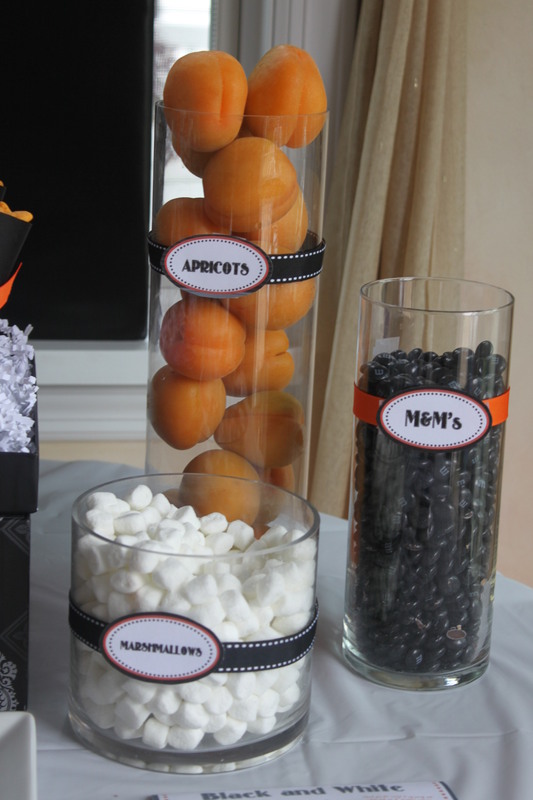 Got the idea from for those from this fabulous candy party. 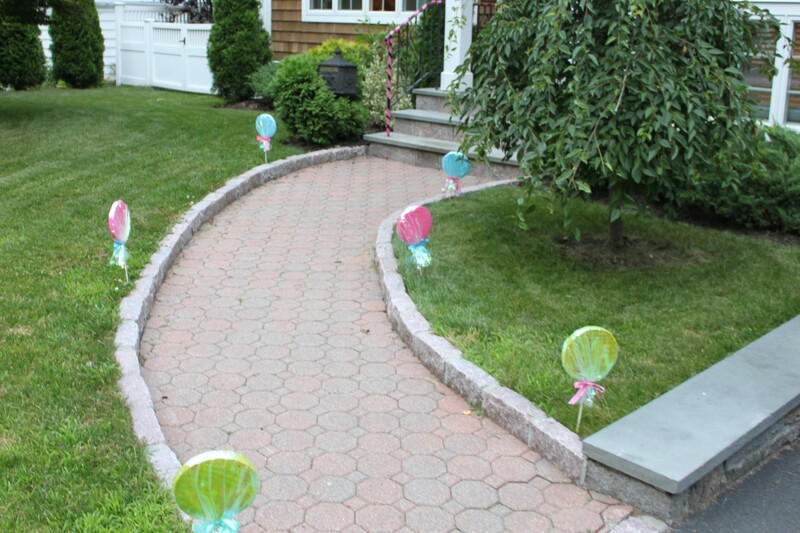 As the guests arrived to the party, they walked on the lollipop lined path. 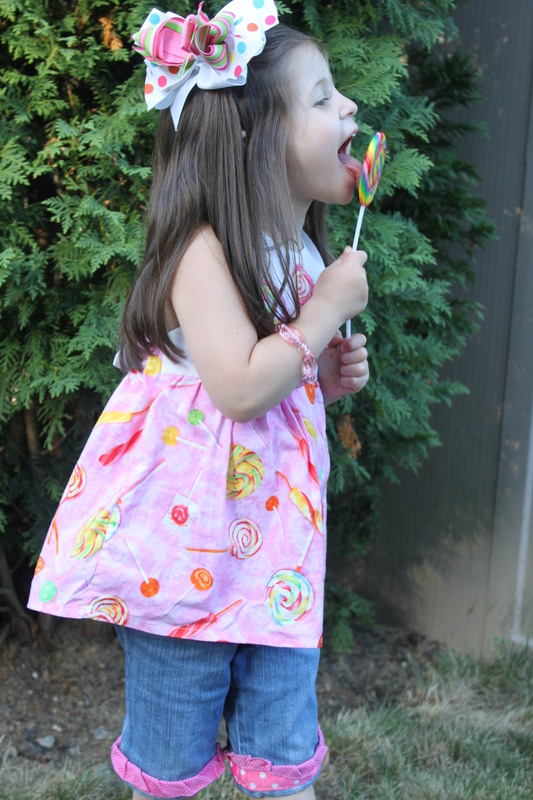 Those lollipops were super easy to make. I stuck a long lollipop stick into styrofoam disks (found at Michaels) that I wrapped with colored tissue paper. 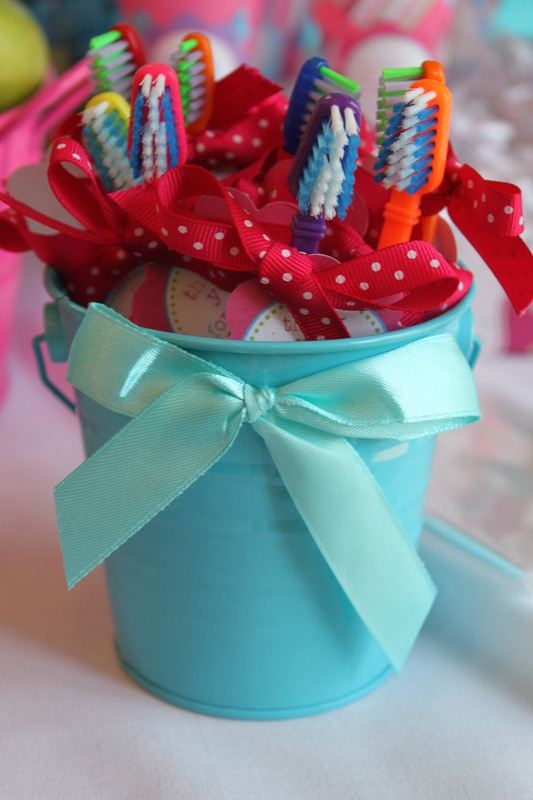 Then I covered the disks with celophane wrap and gathered and tied with a ribbon around the lollipop stick. I saw these here and thought they were adorable. 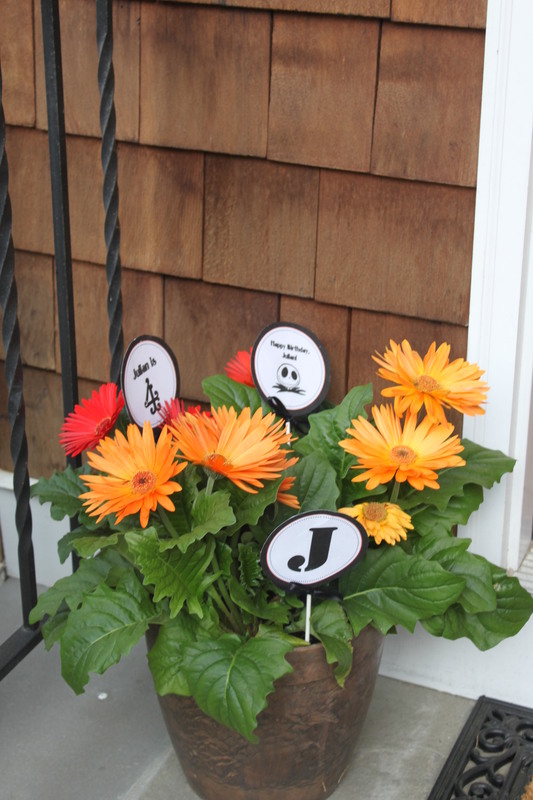 The welcome sign on the door greeted the guests as they came in. 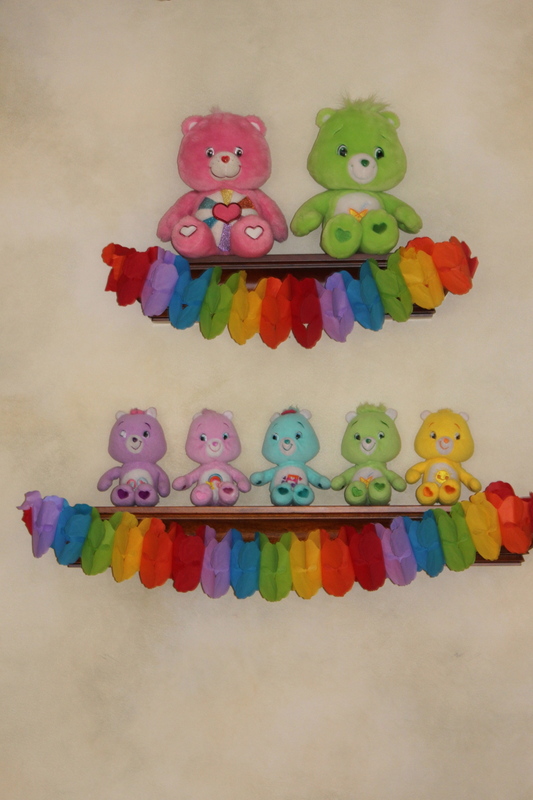 Another cute idea from Kim! As each guest arrived I tried to get a picture of them in the photo booth and then I had them guess how many jellybeans were in the jar. I found this site for games and they had free printables for some of the games and signs. I used their sign for this game and for the signs on the photo booth as well. 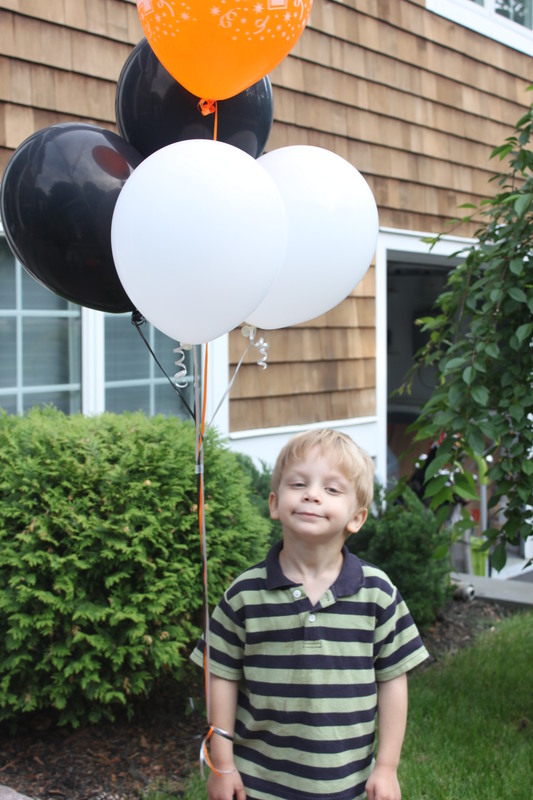 The majority of the party was held outside, so after the kids guessed how many jelly beans were in the jar they headed out to the backyard to make candy necklaces while waiting for the other guests arrived. Here is Madison making her candy necklace. The kids’ tables were set up outside. 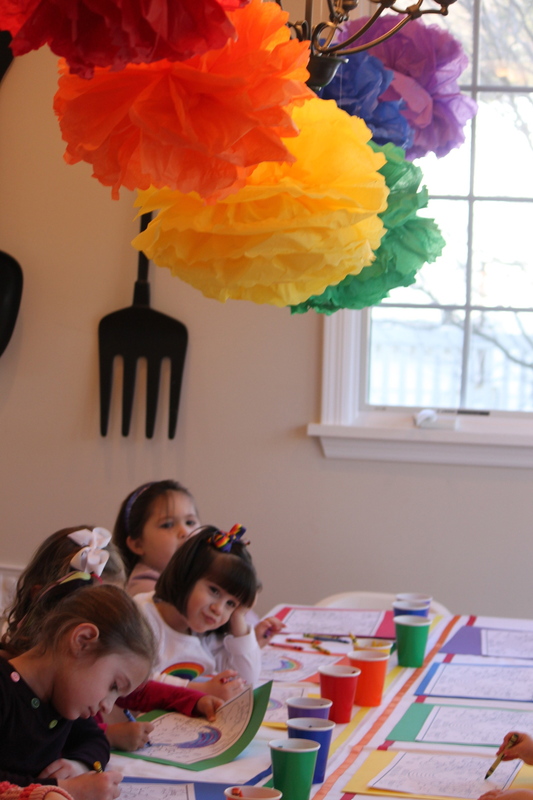 I made the centerpieces using sandpails and large Whirly Pops. 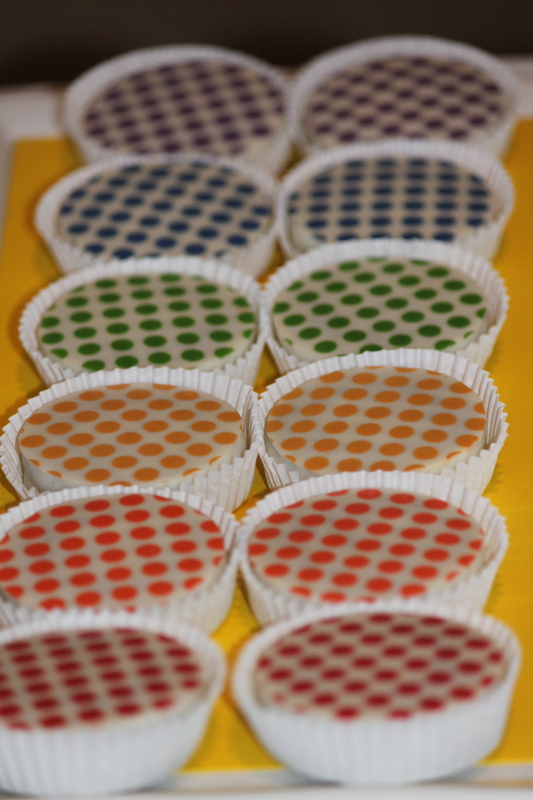 I found these white tablecloths with colorful circles that reminded me of lollies at Target. I used them as a table runner over a turquoise tablecloth. 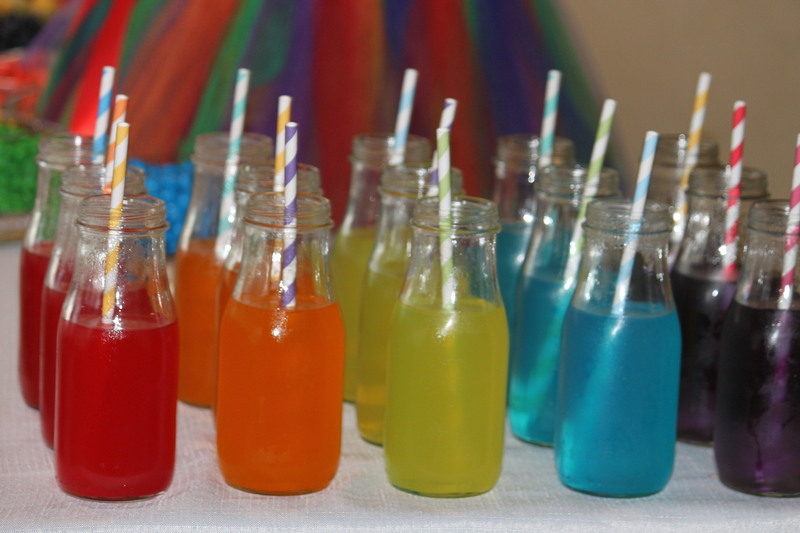 The clear cups in the picture held the candies and elastic for the candy necklaces. 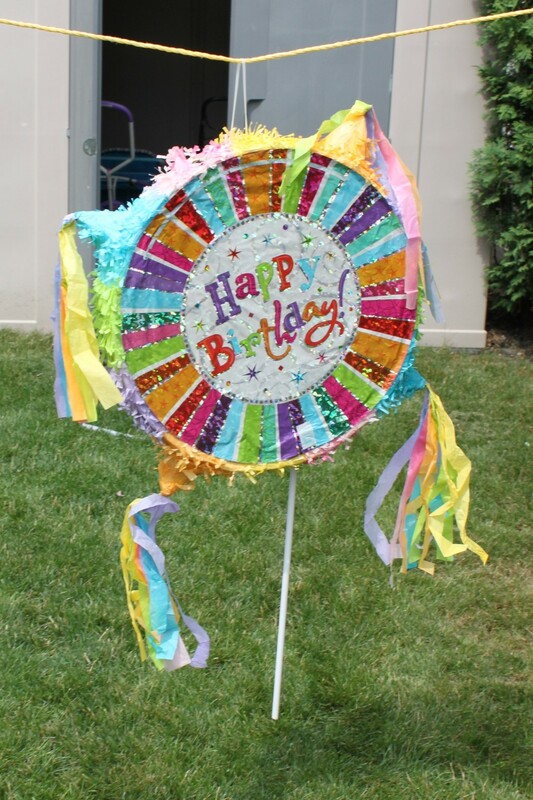 I decorated the fence with Kim’s printable happy birthday banner and more candy lanterns adorned the shrubs. 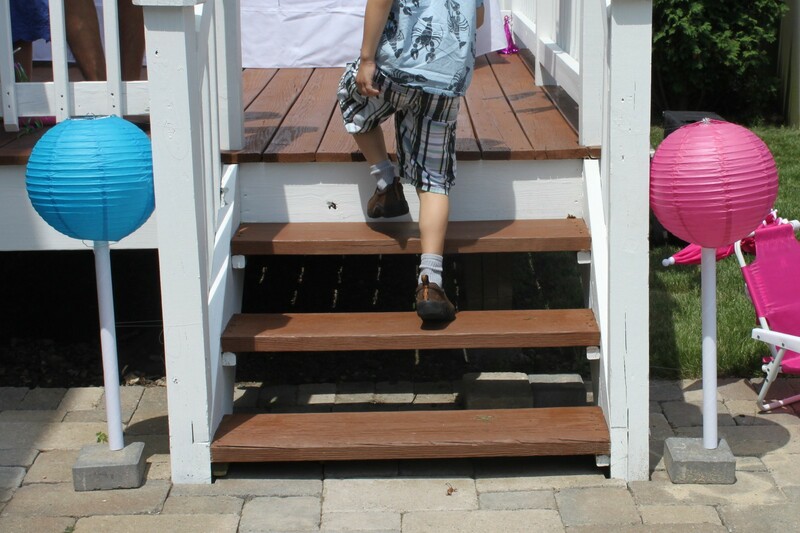 I attached empty wrapping paper tubes to these lanterns to resemble Dum Dums and stood them on either side of the steps leading up to the deck. I didn’t hire entertainment for the party, so I was the one running the show. 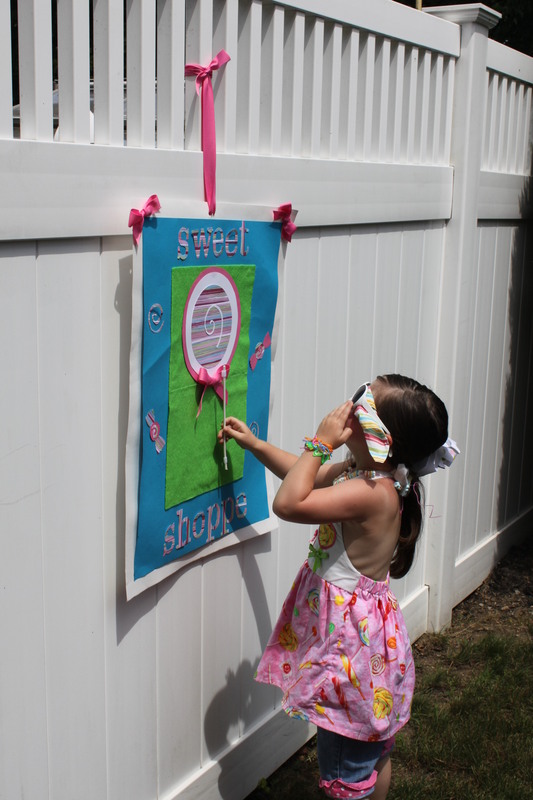 Besides candy necklaces, the activities I planned were Pin the Stick on the Lollipop, Ring the Lollipop, Candy Shoppe Bingo and a pinata. 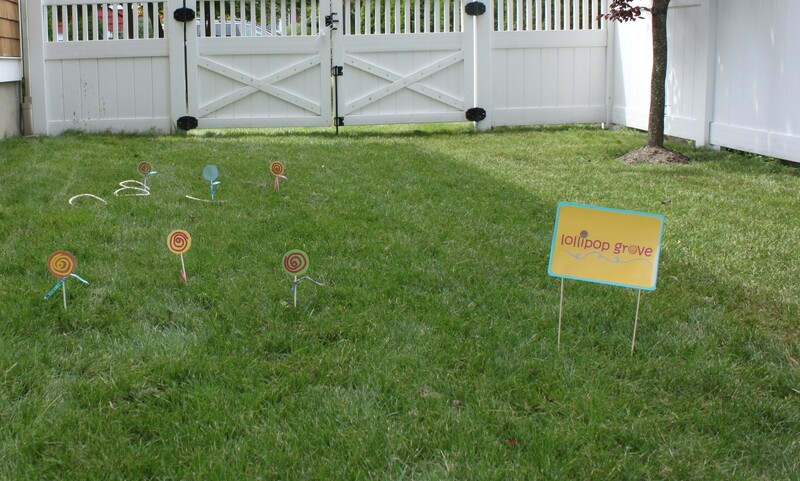 I made the Pin the Stick on the Lollipop Game. I glued a lollipop cutout onto a piece of green felt. 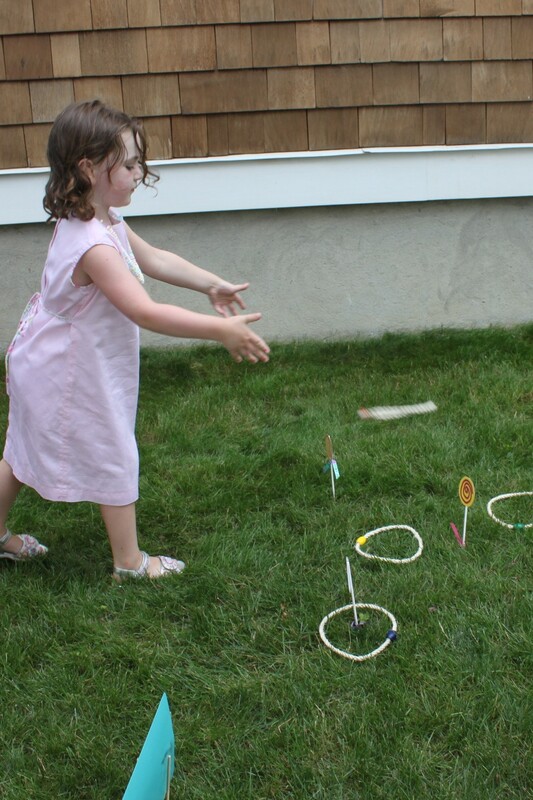 I attached velcro to the lollipop sticks so they would stick on the felt when the kids tried to stick them on. 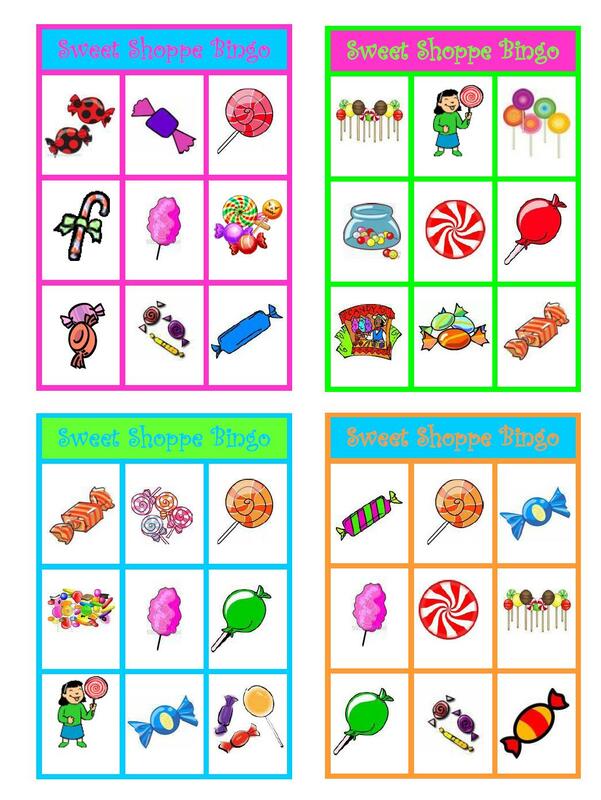 For the Ring the Lollipop game, I used the printables from here. I set them up in the back yard. 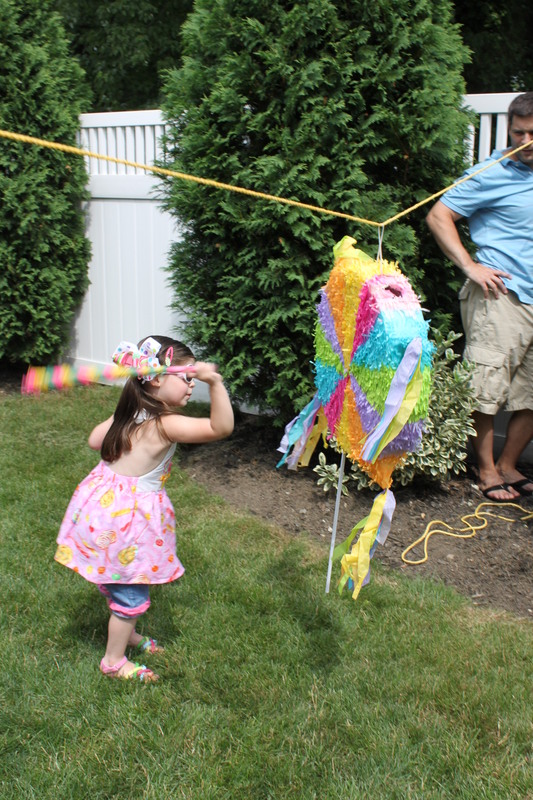 I found a round pinata at Party City and attached a deflated mylar balloon to it. I made it resemble a lollipop by attaching a wooden dowel. I made the cards for Sweet Shoppe Bingo and had them laminated. The kids used Skittles to cover the space. I also made a set of calling cards to go with this. 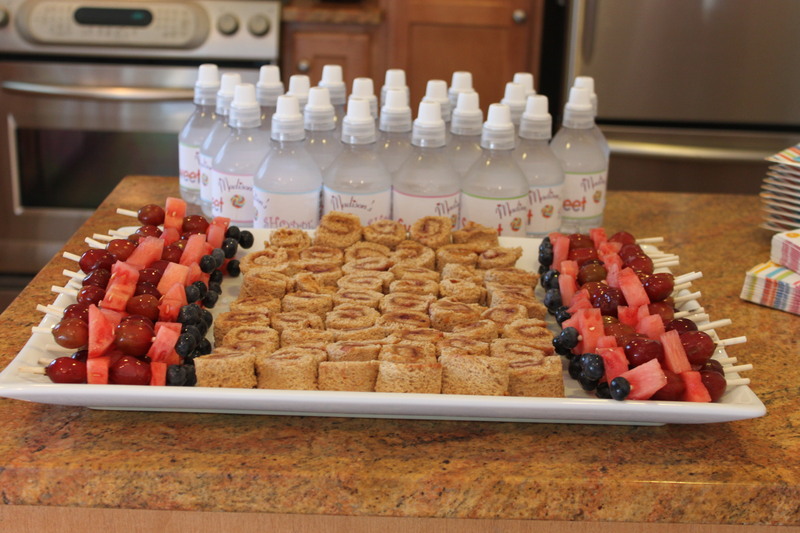 After playing the games, I served a light lunch of peanut butter and jelly pinwheel sandwiches and fruit lollipops. Thanks to Glory from Glorious Treats for the idea. You can see her candy party here. 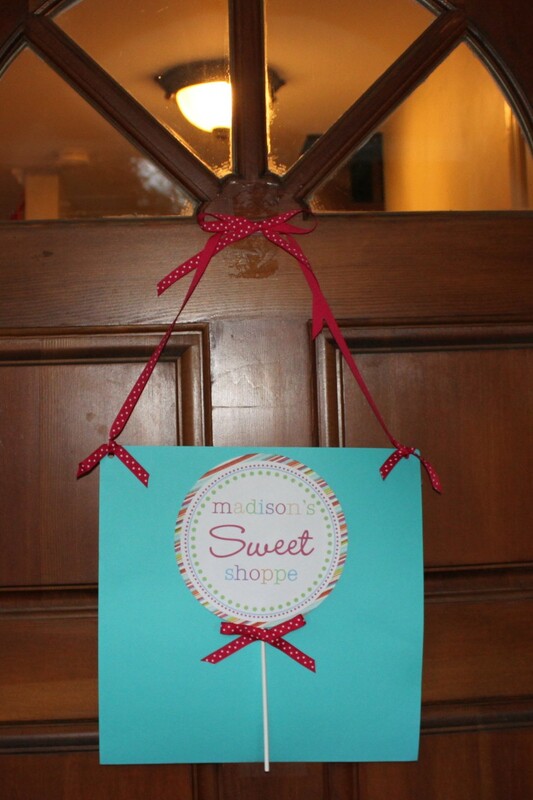 After lunch, the kids visited the Sweet Shoppe and chose candy for their treat bags. 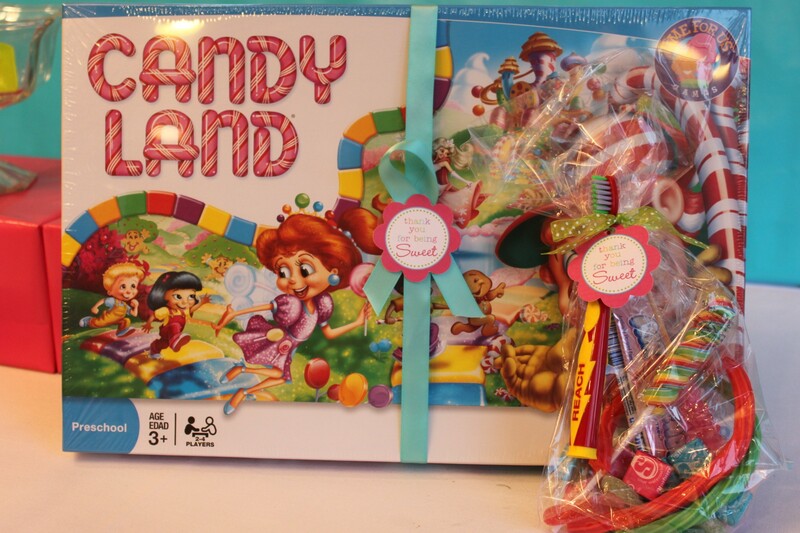 They each went home with a bag of sweets and the classic game Candy Land. 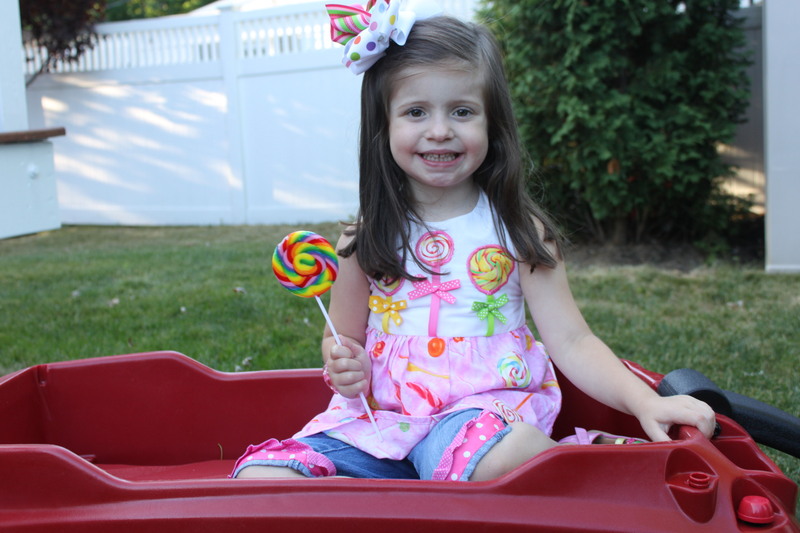 The birthday girl wore an adorable candy custom set by Etsy seller Smockinglisa708. Super cute! I hope you had a wonderful 4th birthday my SWEET Madison Grace. Mommy loves you! XOXO!